Then there were a couple more practical concerns – I wouldn’t be seeing anyone to pawn off this extravagant dessert on until Tuesday. And, let’s be serious, anything that is that amazing to look at and eat isn’t made to last 3 days. 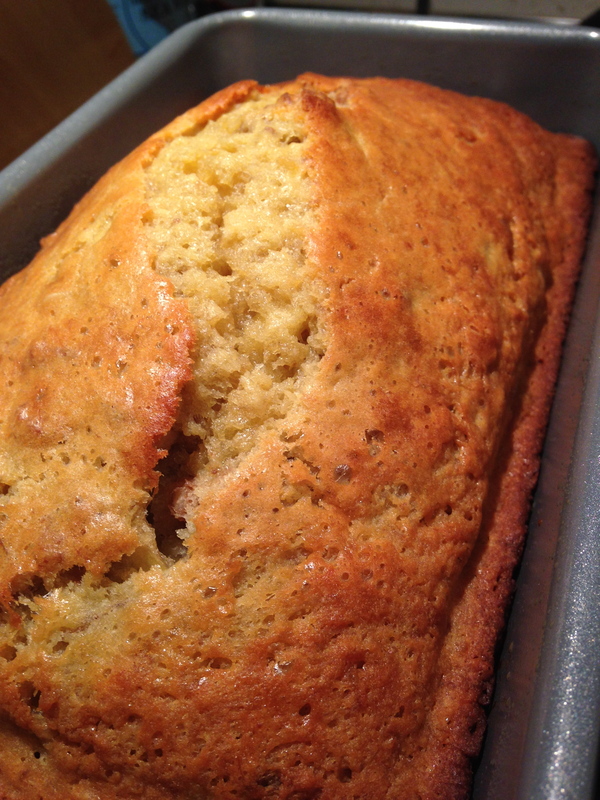 So, rather, I made something decadent that I could enjoy myself without feeling too bad about it: banana bread. 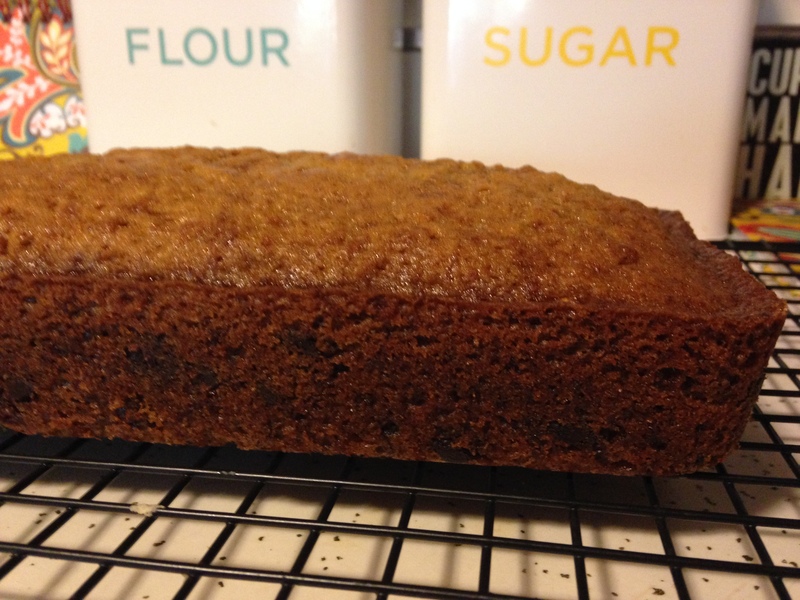 Now, last week, I had emailed my friend Shirlee, of Strawberry Lemonade Bar fame, to ask for her chocolate chip zucchini bread recipe. I could remember her bringing it back to our dorm room after various school breaks, and how delicious it always was. Apparently my mom was right – I invent memories that never happened. She insisted that she actually made chocolate chip banana bread, and sent me that recipe instead. Funny enough, the recipe she sent is actually the same one I’ve always used for banana bread, too, so you can expect to see it in a later post (it includes coconut, so I’m saving it for a time when I’m home with my mom). However, I wanted to try something new. With banana bread on my mind, I turned to the Claire’s Cornercopia Cookbook and decided to try her recipe. You’ll remember that last time I tried one of these recipes, it was a bit of an adventure, but this time brought much more success. So let’s dive right in. 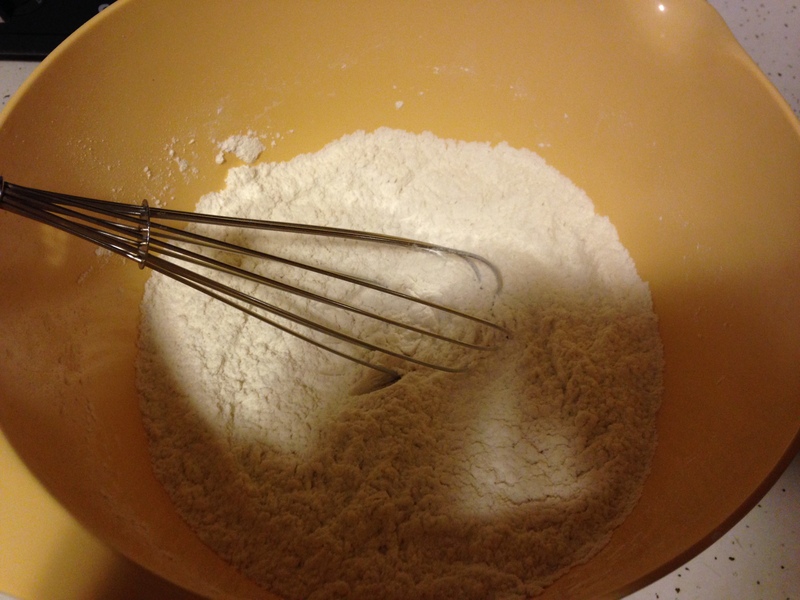 First, whisk together the flour, baking powder, baking soda, and salt. I don’t often bake with salt, but since I messed with the last recipe I tried from Claire’s and it backfired, I decided to stay true to this recipe. 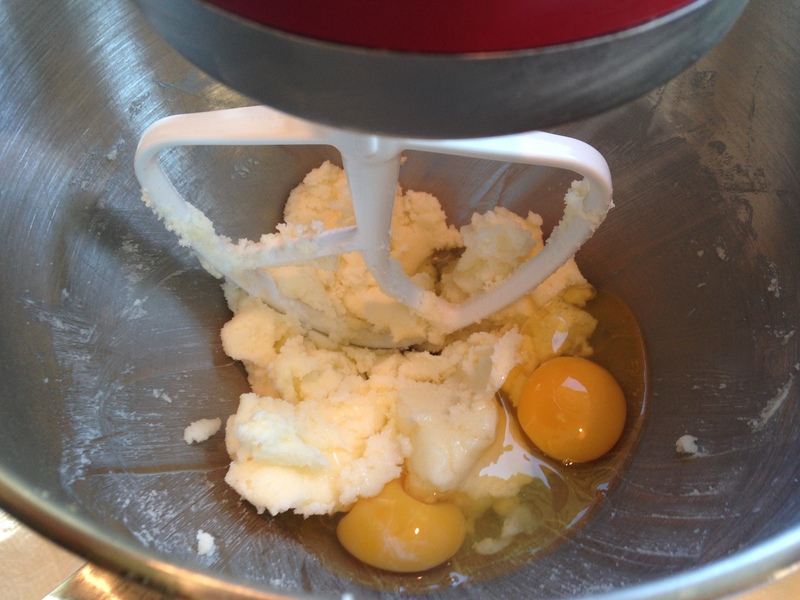 And in staying true to the recipe, I encountered my first real test on the next step – whisk together 7 eggs. Yes, you read that correctly: 7. I was sure that was crazy. Who puts 7 eggs in anything other than a custard? Wouldn’t that majorly throw off any baking ratio science? But, despite my serious shock, I continued diligently. On the plus side, 7 eggs make a cool flower arrangement in a bowl. 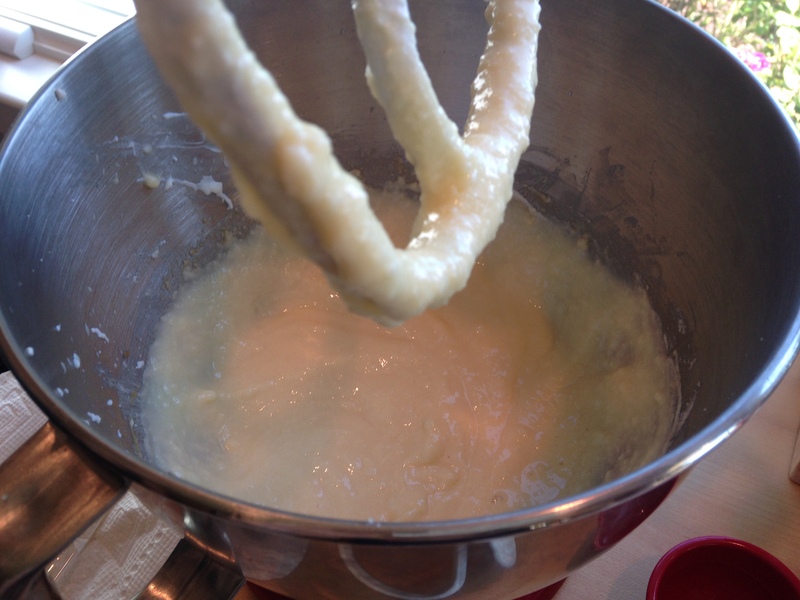 Then, whisk in the sugar and melted butter until well combined. 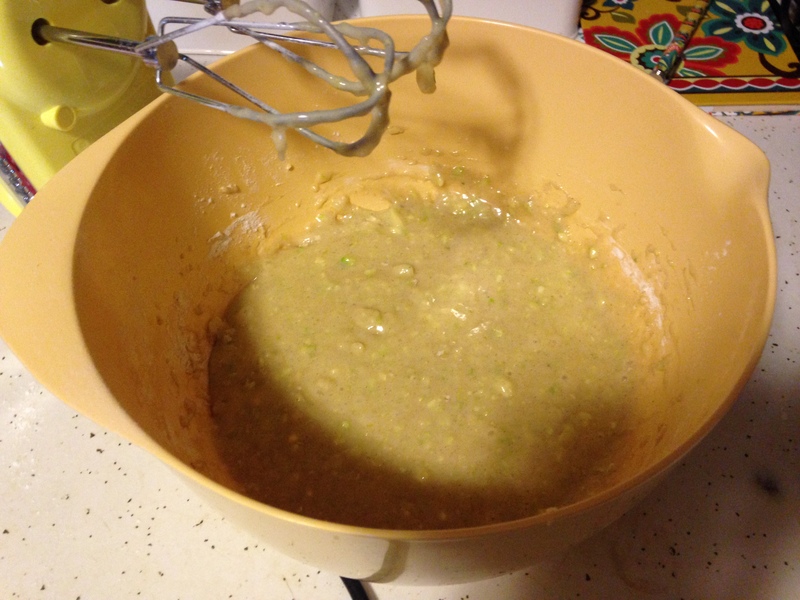 Stir in the mashed bananas. 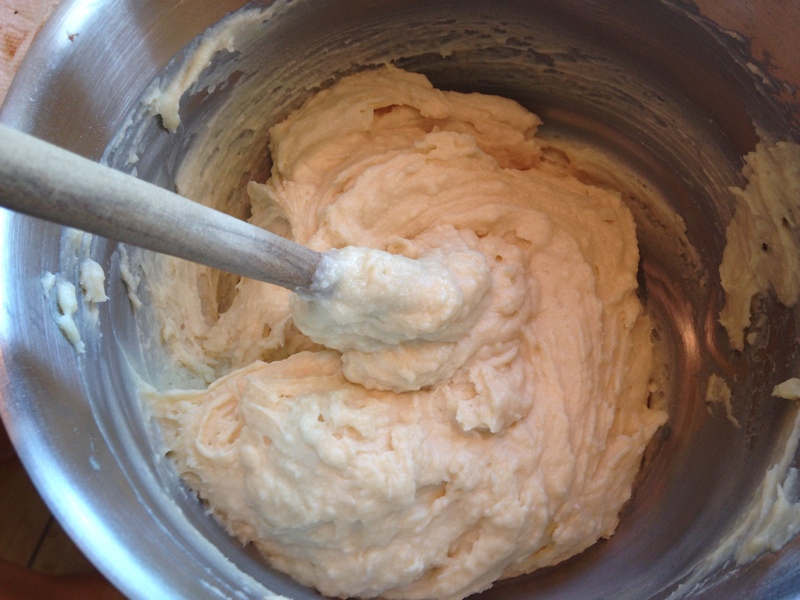 The batter will be exceptionally lumpy. Roll with it. 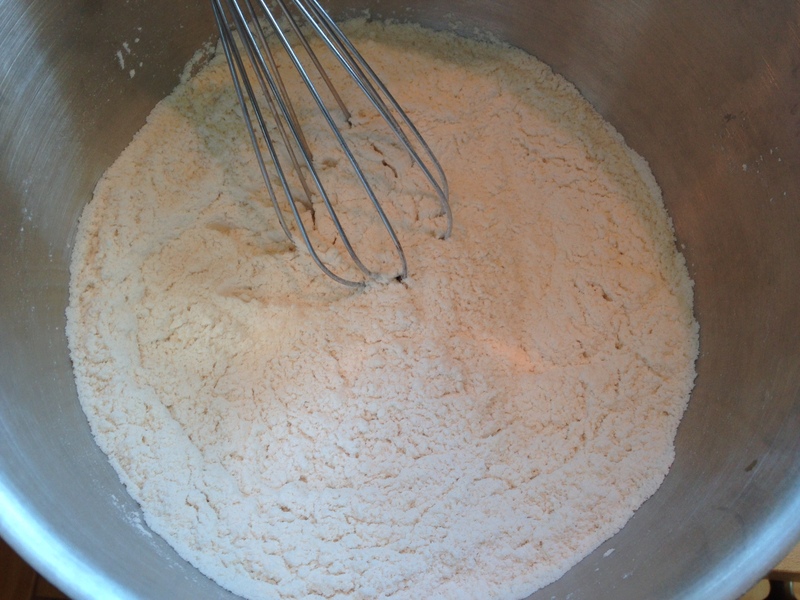 Stir in the flour mixture until just combined. Don’t be fooled by what appears to be combined and just lumpy – those lumps are actually little flour grenades, waiting to be popped. I kind of dragged my spoon up through the lumps to detonate as many as possible. 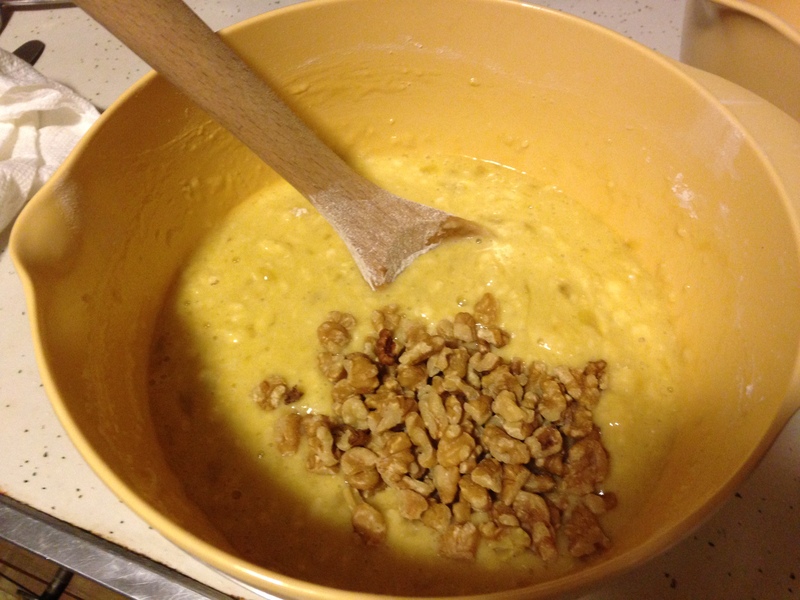 This didn’t even vaguely look like enough walnuts to me, so I poured in the rest of the bag, totaling around 1 cup. 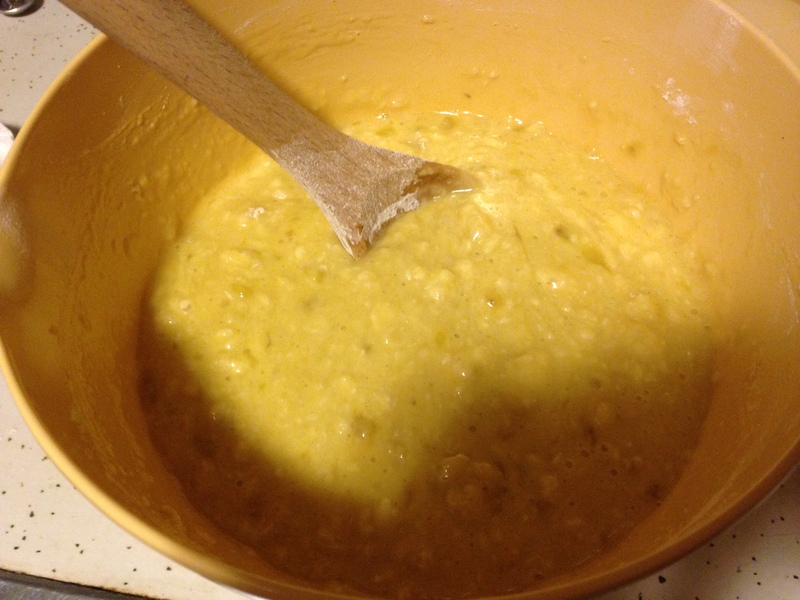 Banana bread, if it is going to contain any sort of mix in, should contain generous amounts of said mix in. 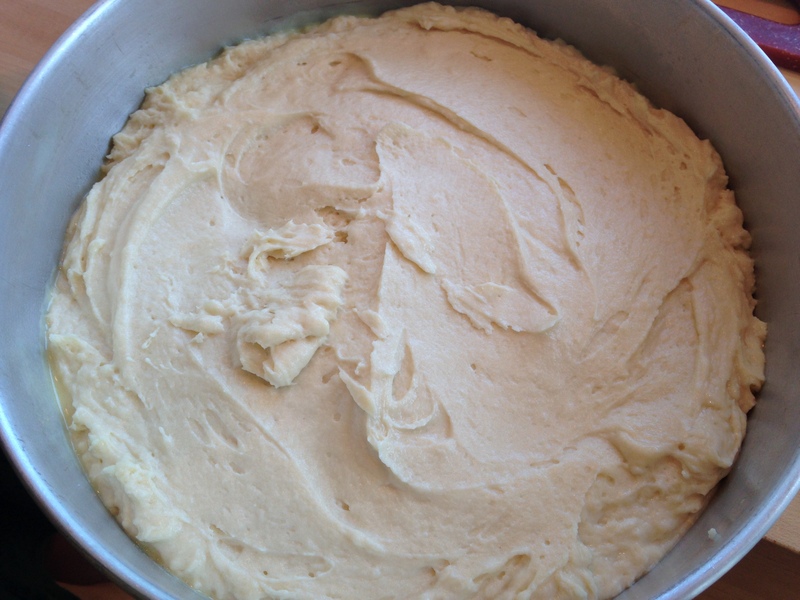 Pour the batter into a sprayed 9×5 inch loaf pan and bake at 350°F for about an hour to an hour and fifteen minutes. A toothpick should just come out clean. I recommend starting to check on it around 45 minutes, since ovens can vary and you really don’t want to end up with dry banana bread. 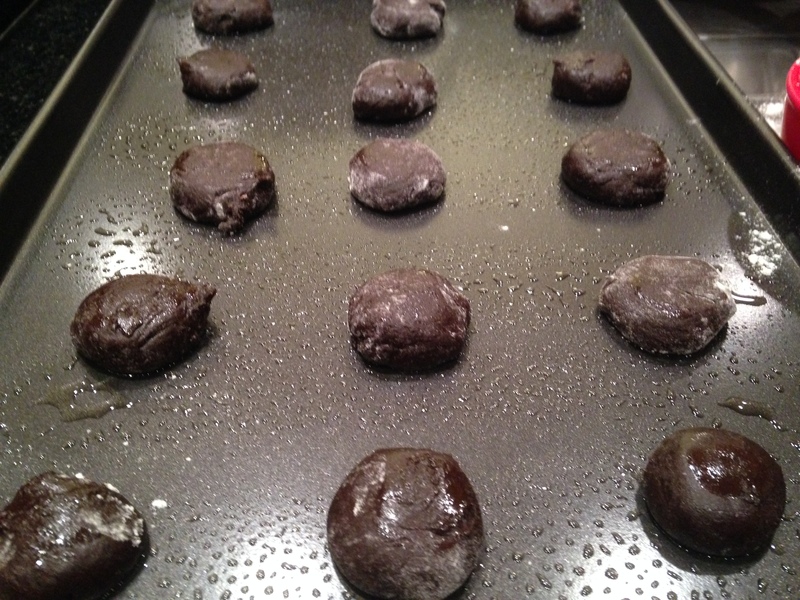 Allow to cool in pan for 5 minutes before turning onto wire rack and cooling further, or serving immediately. 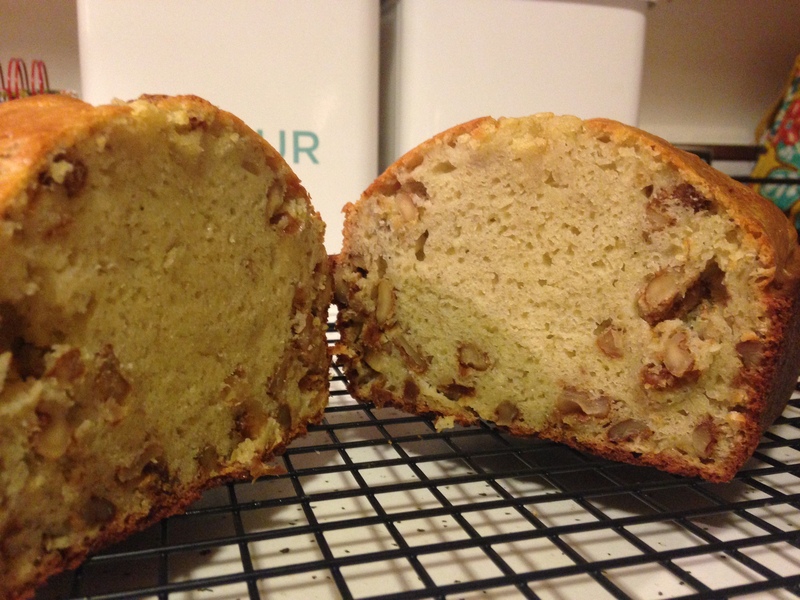 Like the zucchini bread last week, this recipe kind of ended up with a ring of walnuts around the bottom and sides. That’s really nothing to complain about. 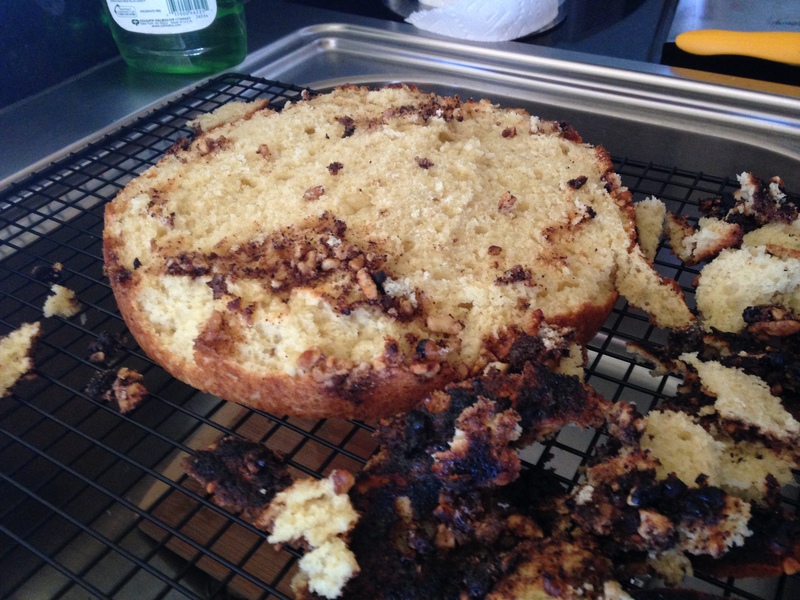 Unlike last week’s recipe, the consistency of the bread was more spongy than moist. I’m assuming this is due to the 7 eggs that found their way into it. However, it did give me a couple of what I think are awesome ideas. First, I think it would be delicious served with some sort of spiced ice cream, like with cinnamon, nutmeg, and ginger – don’t be surprised if I end up testing that hypothesis and next week you learn how to make the ice cream. Second, It would probably also make an exceptional vehicle for bread pudding. All of the gooey goodness would just absorb right into it. I’ve never made a bread pudding, so that could also be an experiment. Anyways, Claire promises the bread will keep well for days if left wrapped in aluminum foil on the counter – I plan on doing that and having banana bread for breakfast for awhile. 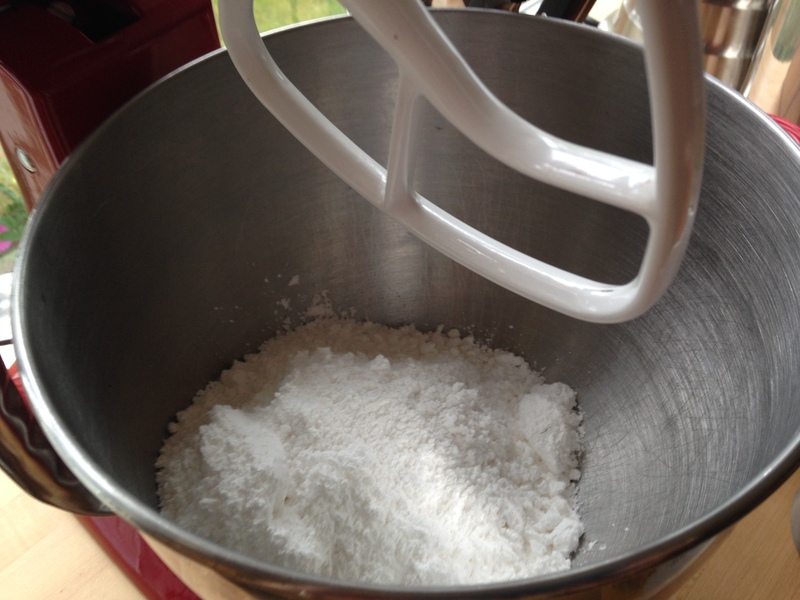 Whisk together the flour, baking powder, baking soda and salt in a medium bowl. 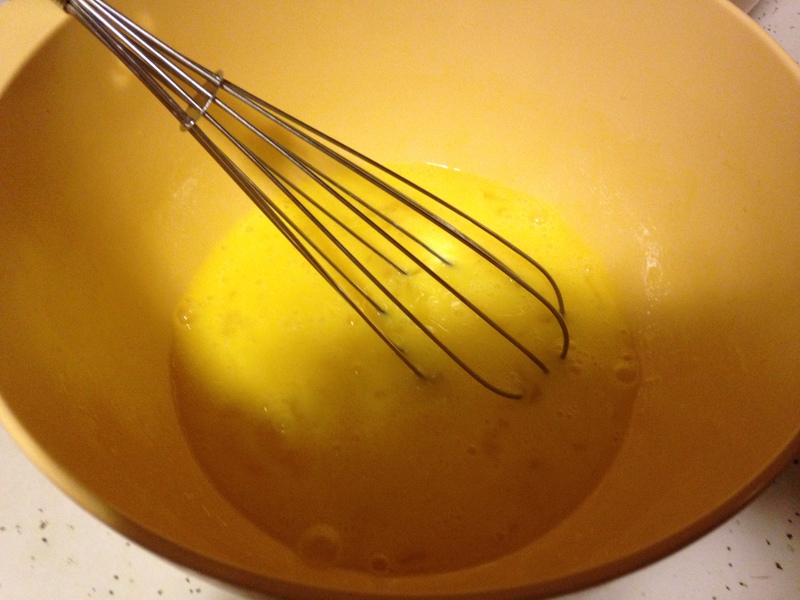 In a large bowl, beat the eggs lightly with a whisk. 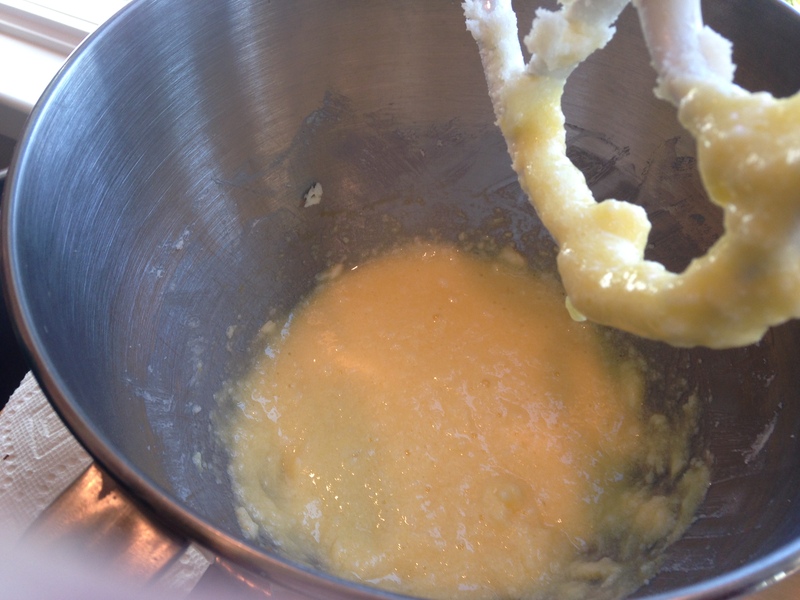 Add the butter and sugar to the eggs, whisking until combined. 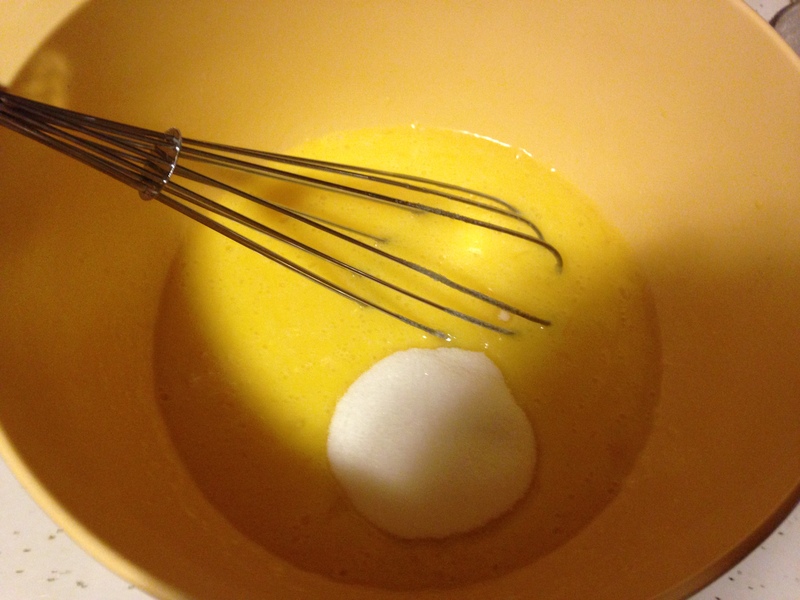 Add the flour mixture to the egg mixture and stir until just combined, making sure to pop any flour bubbles. Pour batter into sprayed 9×5 inch loaf pan and bake at 350°F for 1 hour to 1 hour 15 minutes, or until a toothpick comes out just clean. Cool 5 minutes in pan before serving. I am officially back in New Jersey. School starts next week, and my summer is coming to a far to fast close. After spending the last couple months indulging in the luxury of hanging out with my family and not planning lessons, coming back here was a bit of a shock. That shock was not improved by the fact that my AC unit had leaked, causing my floor to buckle into a mountain range. But, alas, life goes on. 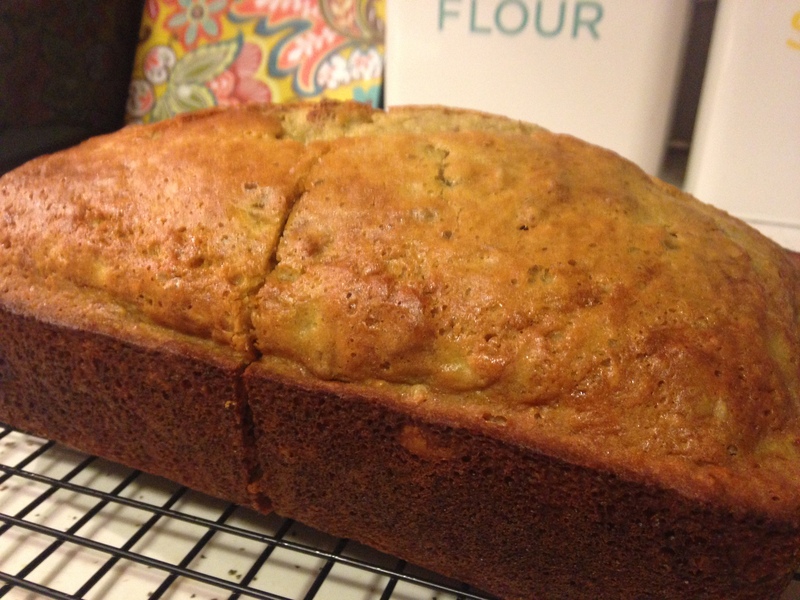 I spend today unpacking my stuff and cleaning as vigorously as I could without being able to clean floors yet, and still managed to find time to bake some zucchini bread! 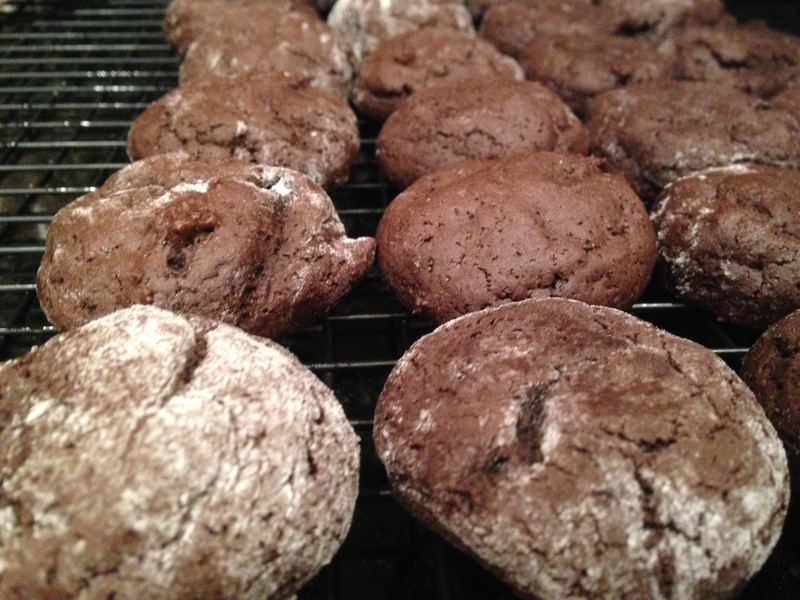 I had initially planned to make all sorts of cool baking substitutions to make this recipe healthy. I was going to replace eggs with chia seeds (which apparently A&P doesn’t stock) and half the oil with applesauce (which goes moldy and smells like vinegar if you leave it in the fridge too long). 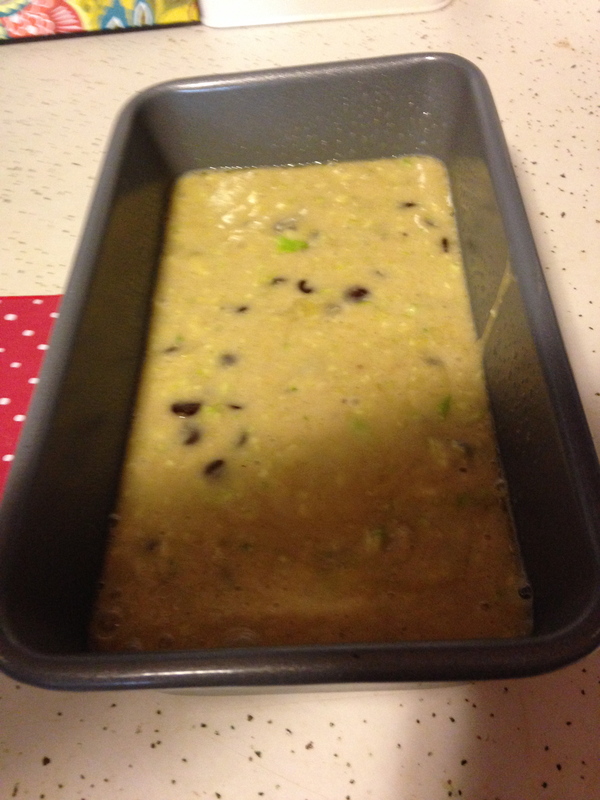 But, when those didn’t work out, I embraced the unhealthiness of this vegetable-based bread and added chocolate chips. So, the first thing you have to do is beat the eggs. 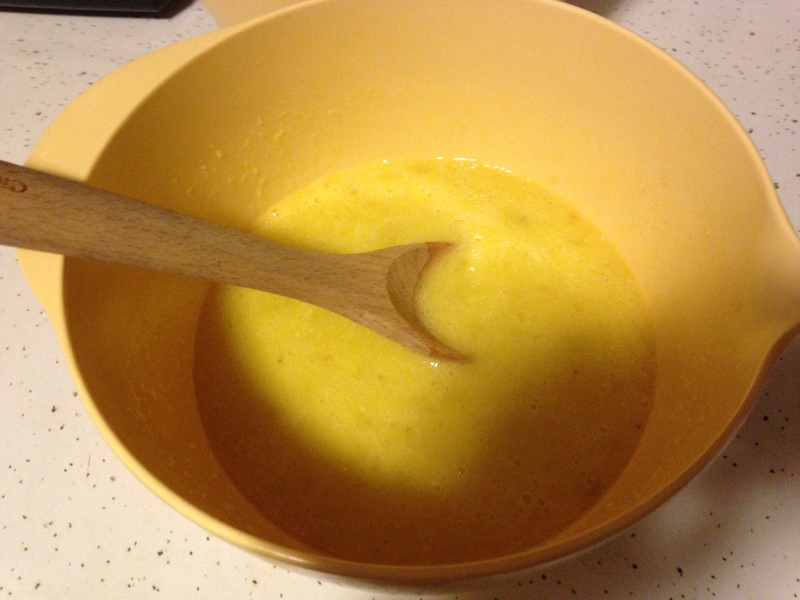 To use half an egg, just whisk an egg for a bit in a bowl and pour in about half of that mixture. 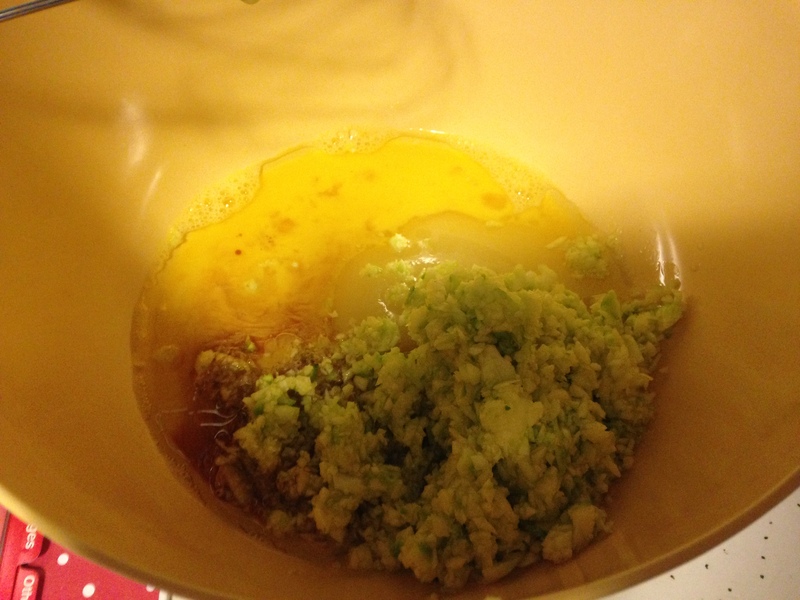 Then, beat in the sugar, oil, vanilla extract, and grated zucchini. In case you aren’t sure how many zucchini to buy to get 1 cup grated, it’s one medium zucchini. Not three. I don’t know why I thought that a zucchini and a carrot would yield a similar amount of grated vegetable, but that’s what I was basing my purchasing on. So I need to find zucchini recipes for the rest of the week. 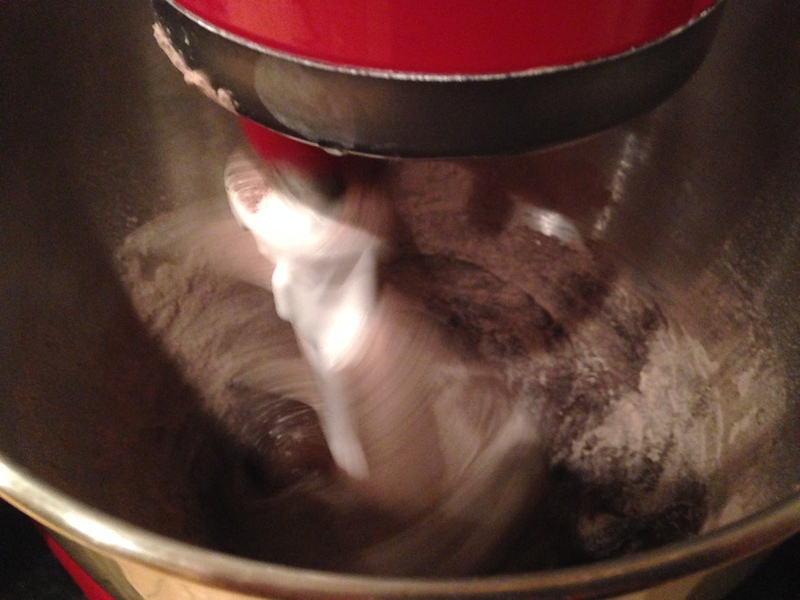 Then, add the flour, baking soda, baking powder, and allspice. Beat until just combined. Stir in the chocolate chips by hand. I just used one full 6 oz package, but add more or less, or substitute for nuts, as you see fit. 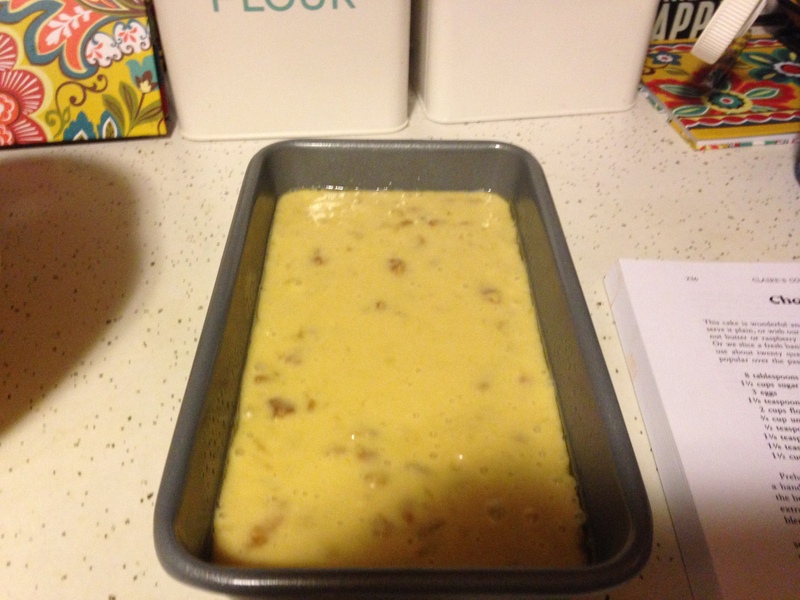 Pour the batter into a 9×5 inch loaf pan sprayed with Pam. Bake at 350°F for 40-50 minutes until a toothpick inserted in the middle comes out mostly clean. Cool in pan for 15 minutes before turning onto wire rack to cool completely. With the sheer amount of oil and sugar that goes into this, it’s hard to convince yourself that it’s at all healthy, despite zucchini being in the title. Nevertheless, I advice you to embrace it and take solace in the fact that you are actually at least getting a serving of vegetables. 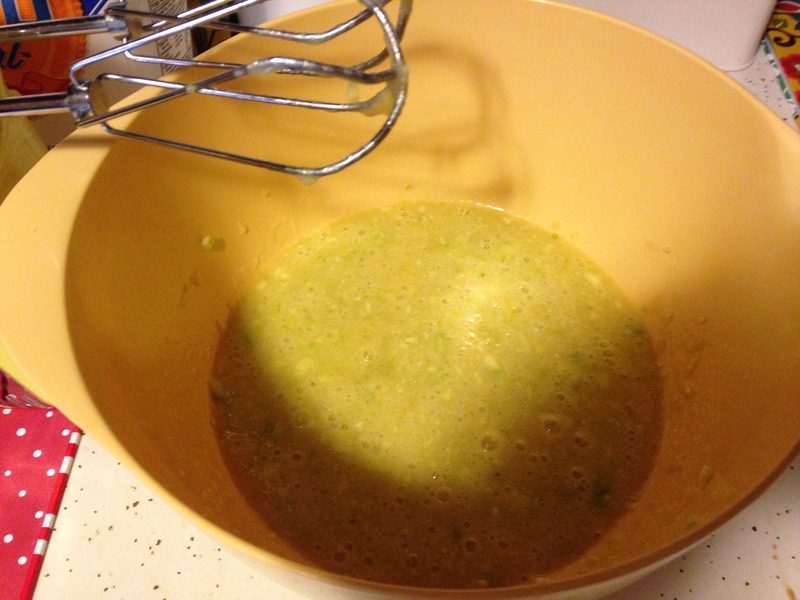 Add sugar, oil, vanilla extract, and zucchini and beat until combined. 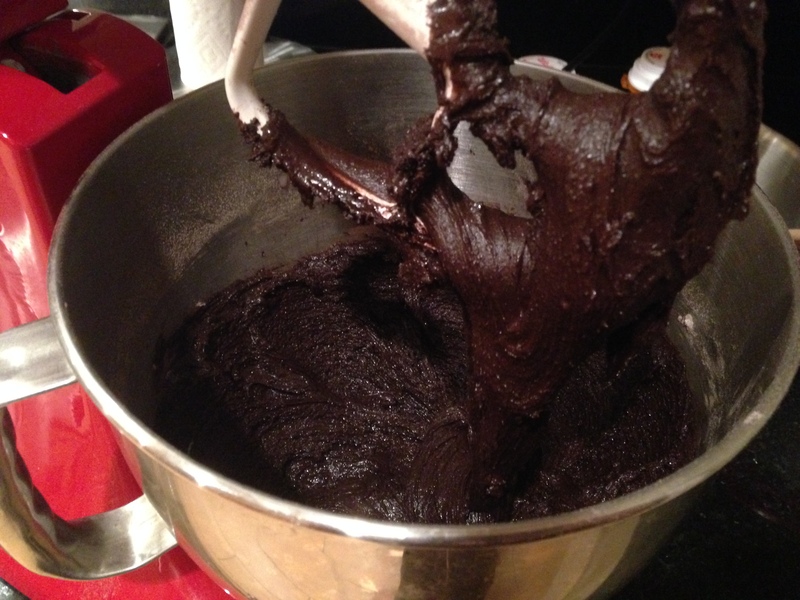 Add flour, baking powder, baking soda, and allspice and beat until just combined. 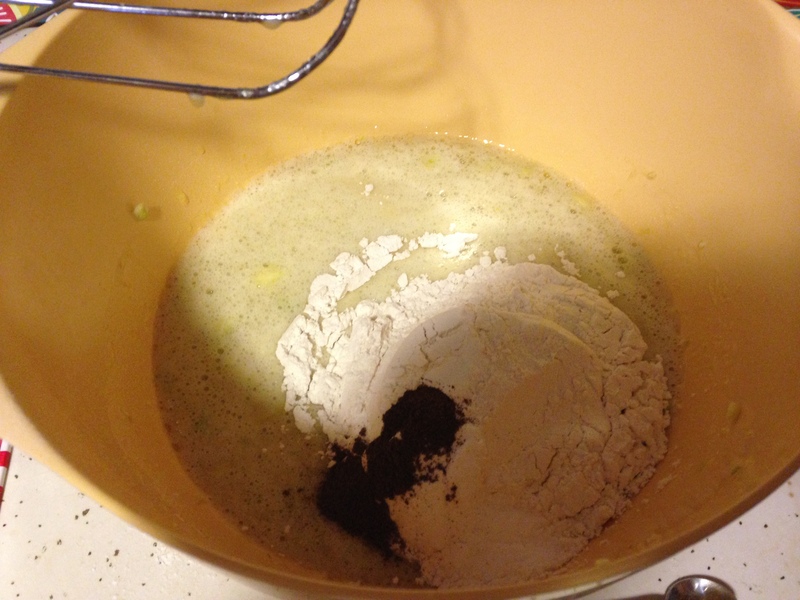 Pour batter into sprayed 9×5 inch loaf pan. Bake at 350°F for 40-50 minutes until a toothpick inserted in the center comes out clean. Cool for 15 minutes in pan before transferring to wire rack to cool completely. On Friday, I played a round of golf with my dad (I get out maybe once a year) and we were discussing summer desserts. I, personally, am of the belief that any real dessert has to include chocolate, and the denser that chocolate, the better. 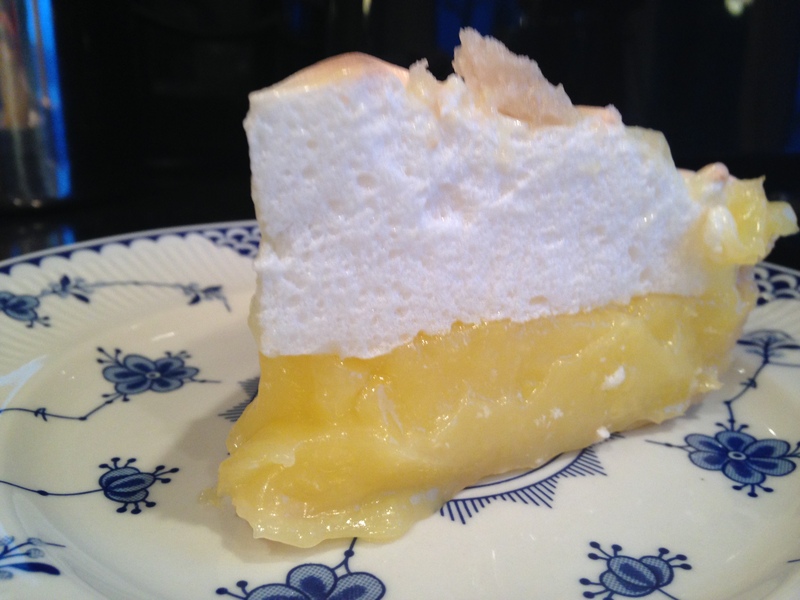 However, my dad, also a sweets connoisseur, was arguing for the merits of a light, sweet, lemon meringue pie. 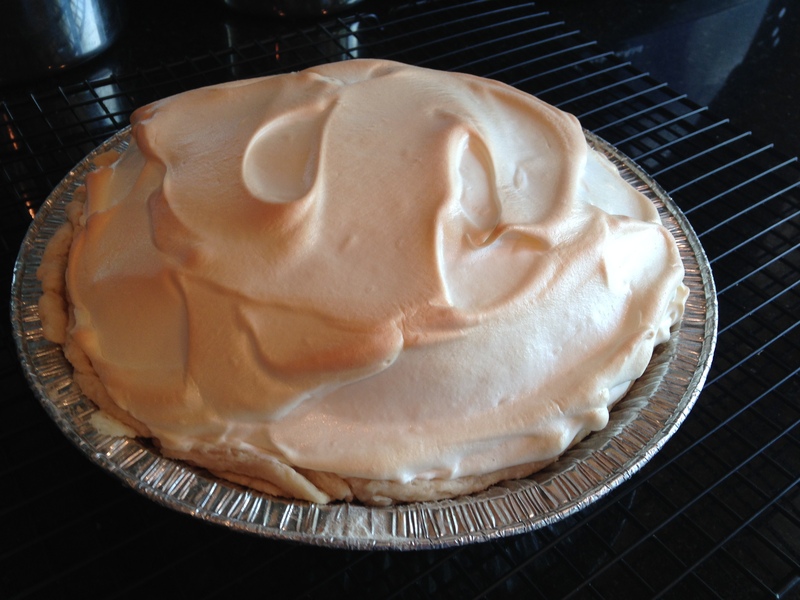 I have always shied away from meringue, because some part of me was convinced it was far too hard to make (it’s not), and have never actually truly made a pie from scratch, crust and all. But, after flipping through a couple cookbooks and spending a considerable amount of time on Pinterest, I decided to give it a go. Speaking of Pinterest, if you want to see all of my recipes in a mildly easier format than my blog, you can follow me here! My grandmother, aunt, and cousin all came over for dinner last night, and since my mom was grilling steak, a light dessert seemed the right choice. 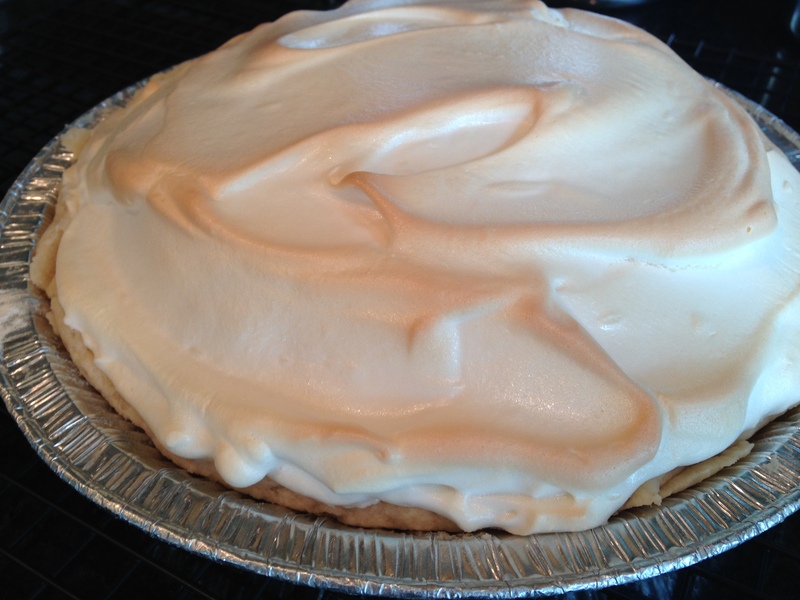 Apparently it was; my grandmother declared it was “the best lemon meringue pie she has ever had.” That sort of praise does not come lightly, so without further ado, lemon meringue pie! 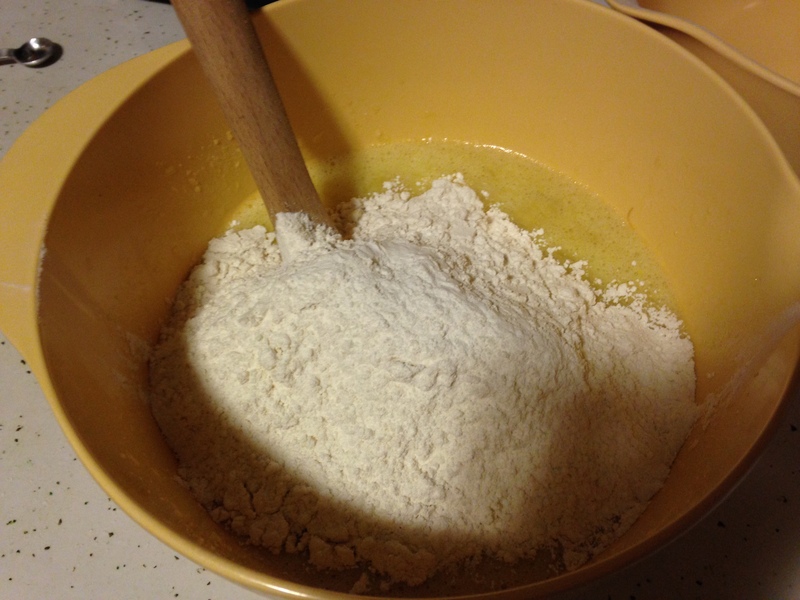 First, mix together the flour and salt in a medium bowl with a fork. Then, cut in the shortening until the crumbs are pea-sized. 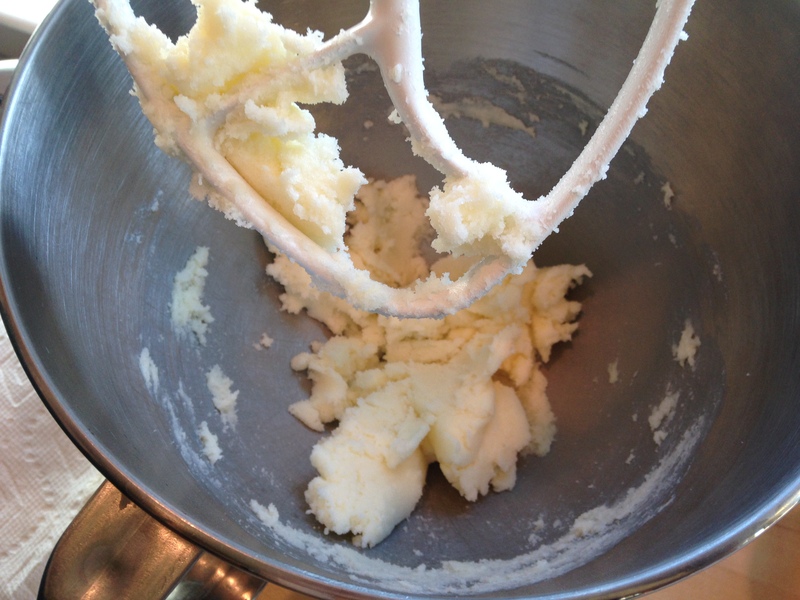 I still don’t have a pastry blender, so I used the two knife method I learned way back in Home Ec in middle school. 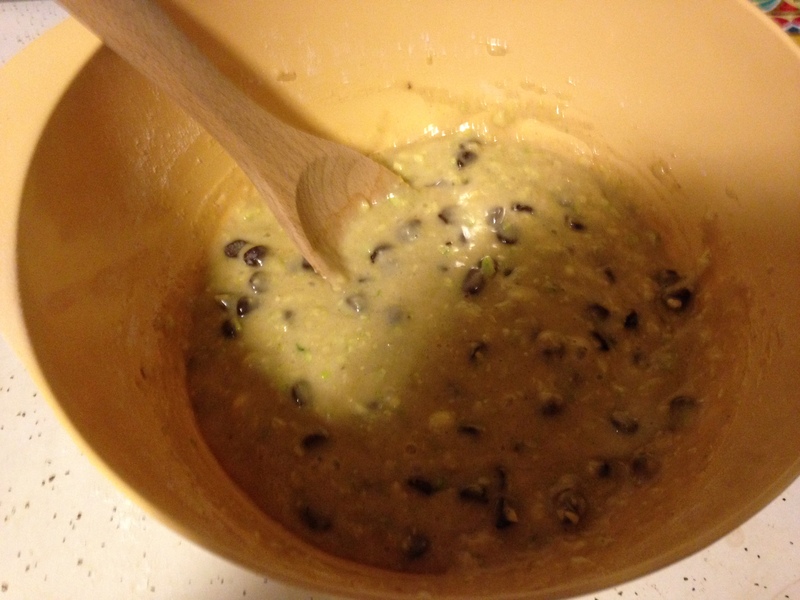 Add the water, one tablespoon at a time, mixing with a fork until dough pulls together away from the sides of the bowl. This next tip I learned at a Williams-Sonoma technique class. If you are near a Williams-Sonoma, I highly recommend stopping in on Sundays for the free classes. They cover all sorts of things and you can make a full meal out of the samples you get to try. 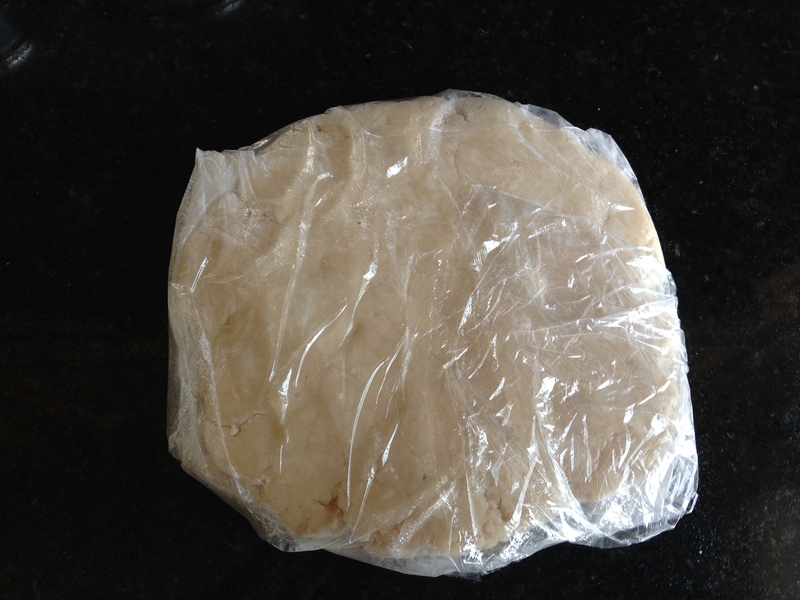 Lay out a piece of plastic wrap and lightly flour it. 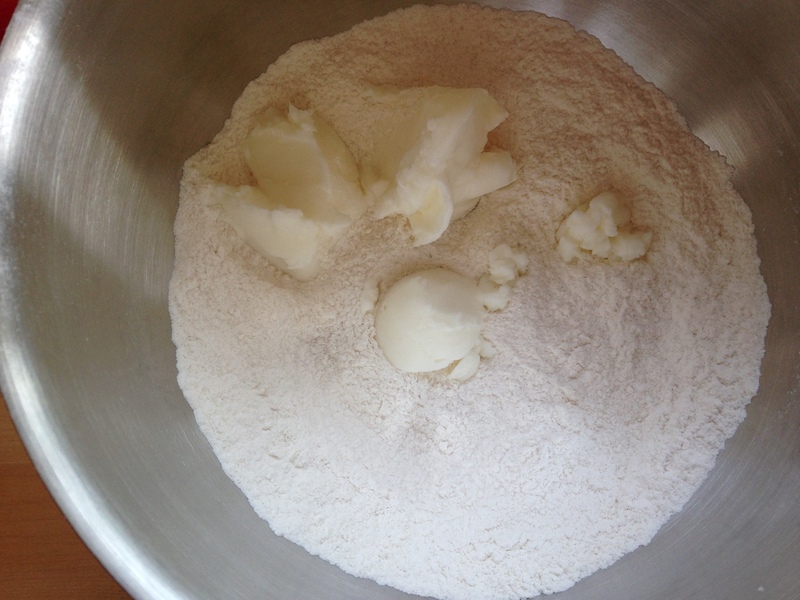 Gather the dough into a ball and place it in the middle. Flatten it into a round disc, and wrap with plastic wrap. Refrigerate for about 45 minutes to get the shortening to chill. 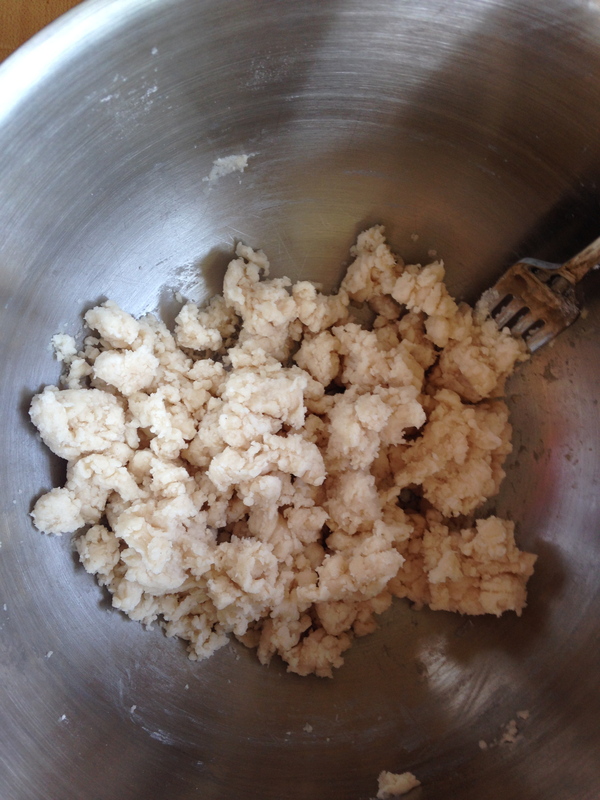 Lay out a piece of wax paper and lightly flour. Put the chilled dough in the middle and roll out to about 2 inches wider than a 9 inch pie plate flipped upside down. I got impatient and didn’t roll it out enough, which came back to bite me later, but that’s life. 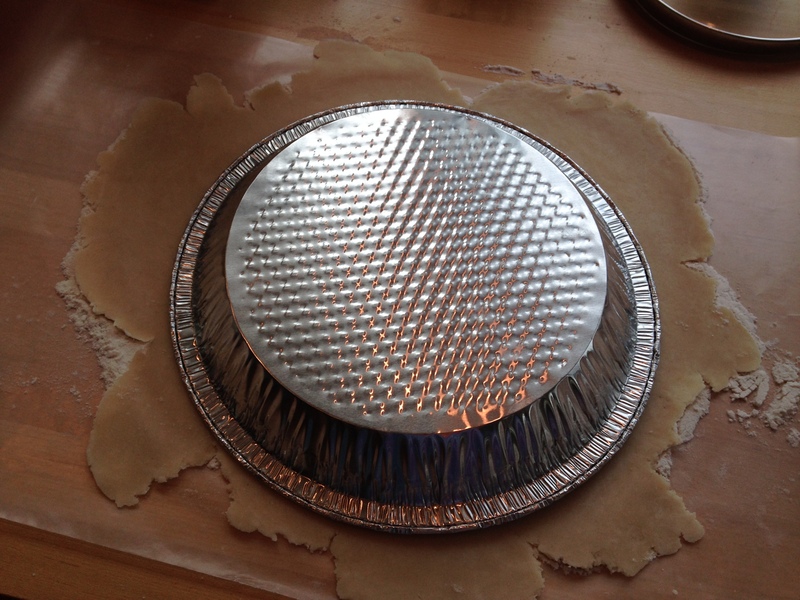 Flip the dough into the pie plate push into the bottom and sides. 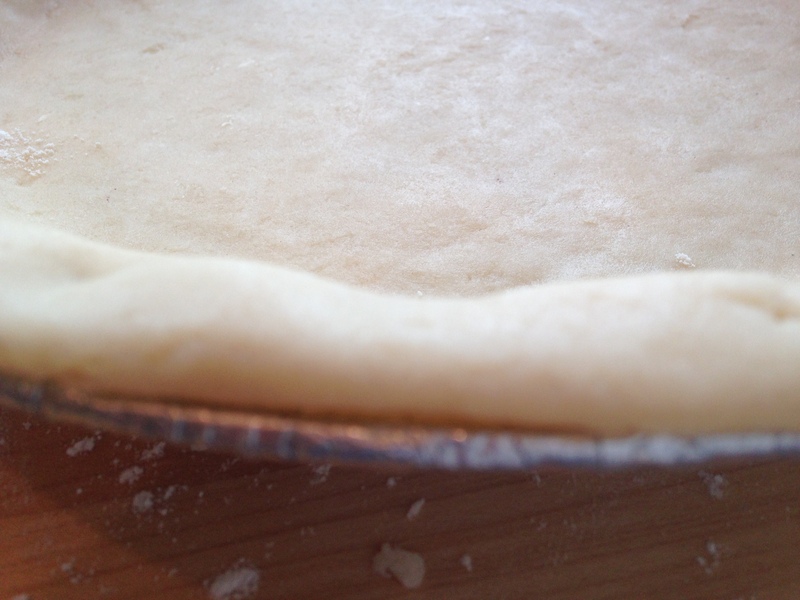 Roll the edges under and flush with the side of the plate. Flute as desired. Prick thoroughly with a fork and bake at 475°F for 8-10 minutes until lightly browned. Remove to a wire rack to cool completely. 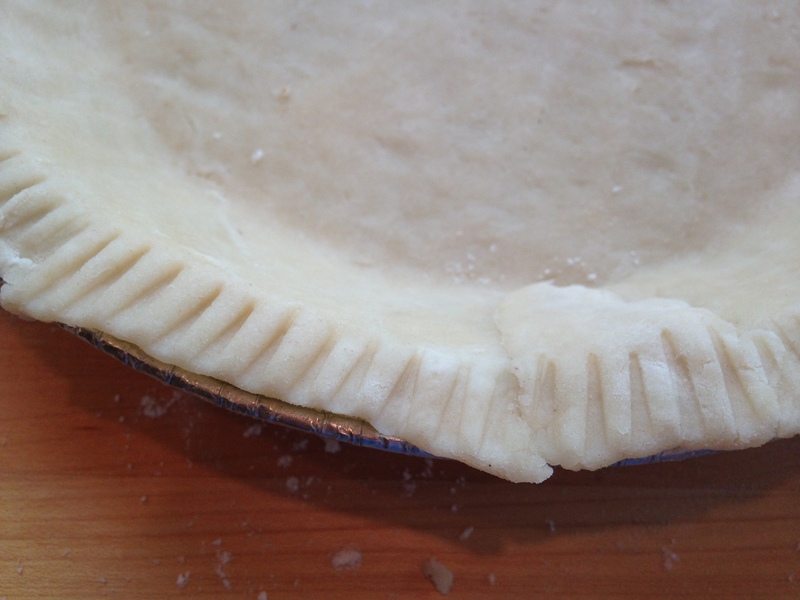 In the next picture you’ll see what I mean by not rolling it out enough – my crust shrunk on me. Oh well. Reduce the heat of the oven to 400°F before continuing. 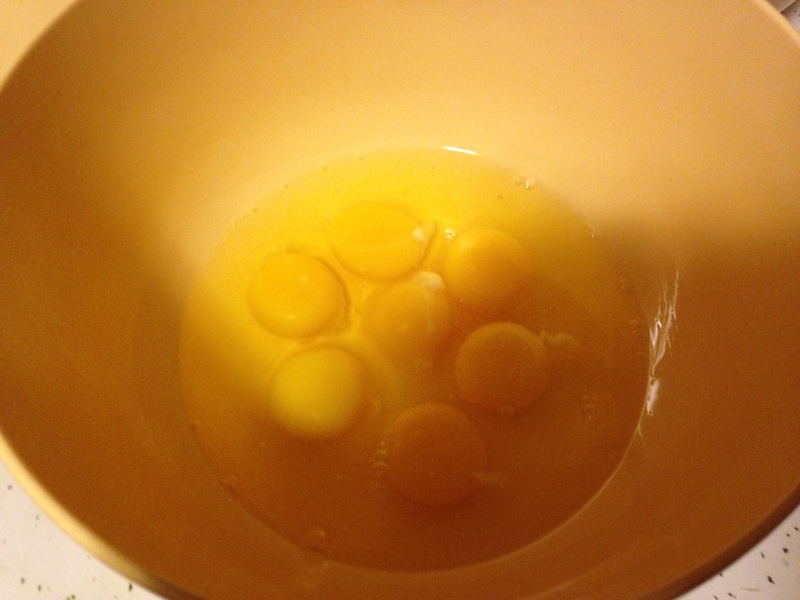 Then, separate three eggs. 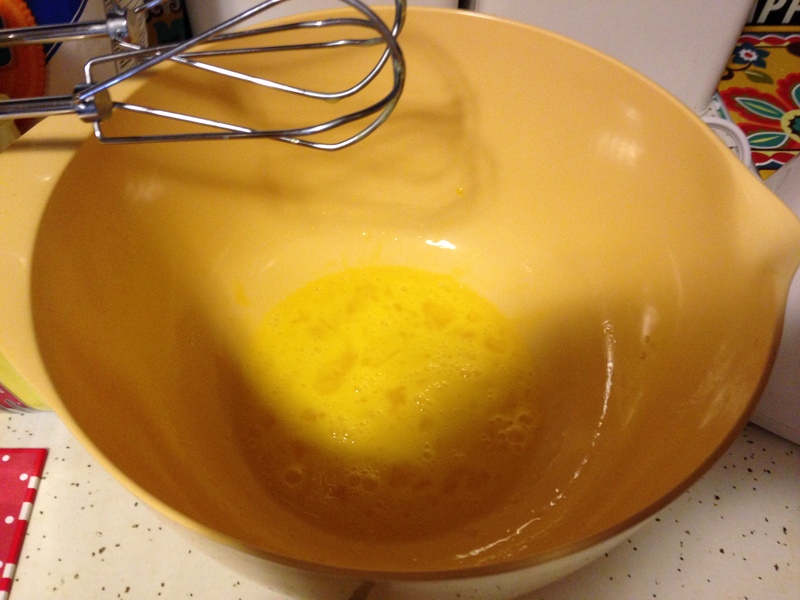 Put the yolks in a small bowl and the whites into the bowl of a stand mixer. 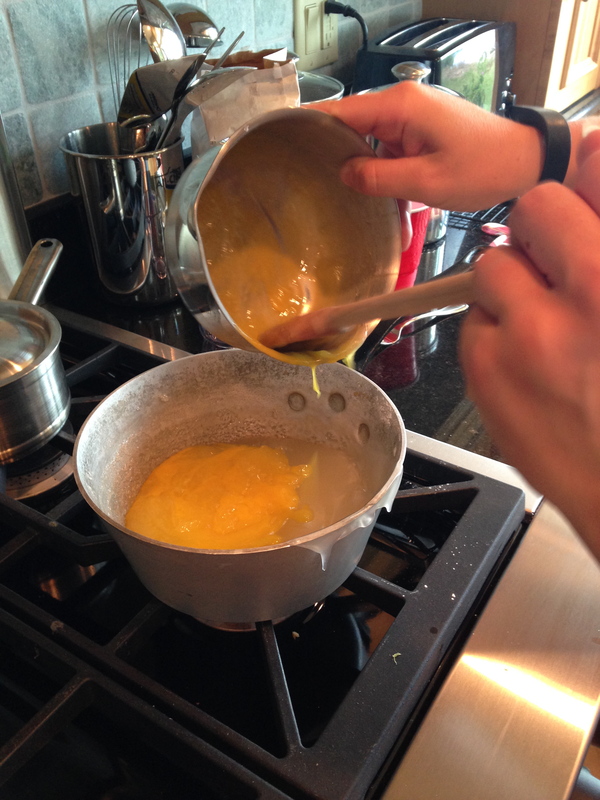 Beat the egg yolks with a fork. In a medium saucepan (no heat yet! 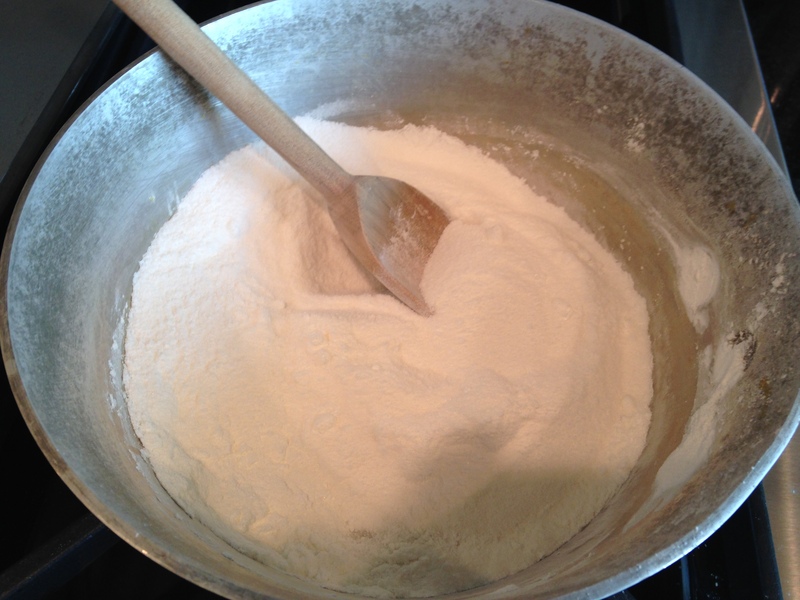 ), mix together the sugar and cornstarch. 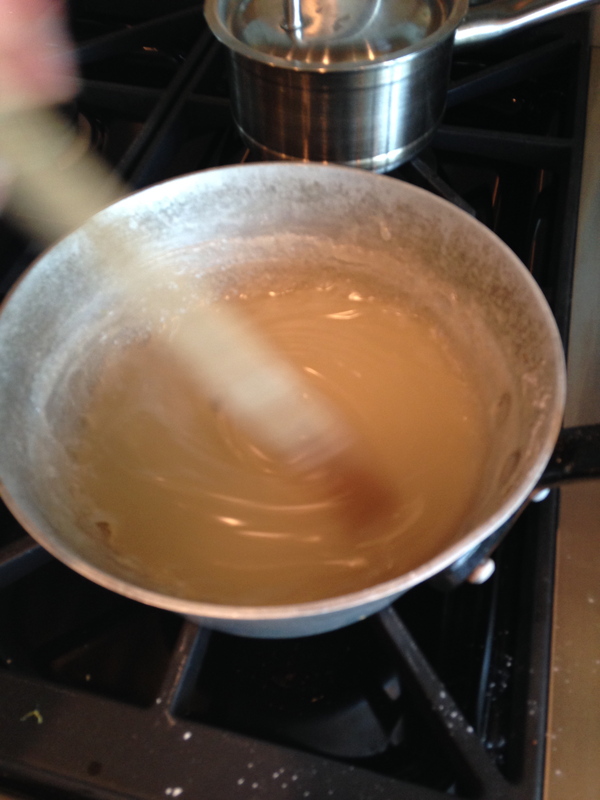 Add the water gradually and mix into saucepan as well. I did about half a cup at a time. Now you can turn the stove onto medium heat and cook, stirring continuously, until it has boiled for a minute and begun to thicken. It goes from liquid to really thick scarily fast, so don’t let that alarm you. 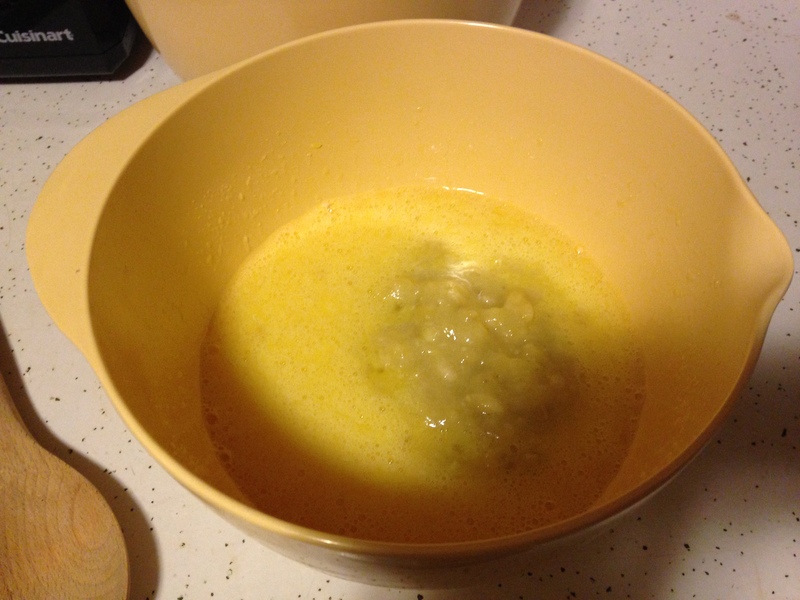 Pour about half of the mixture into the egg yolks and mix. 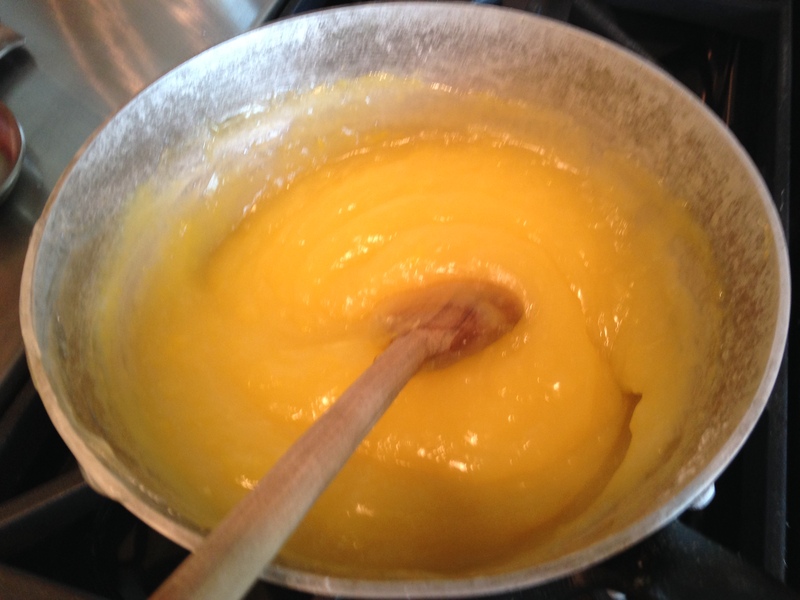 Then, pour that egg yolk mixture back into the saucepan and continue to cook over medium heat, stirring constantly, for about 2 minutes. Photo credits to my mom on these shots – I was busy being stressed about cooking things over heat and ruining them. 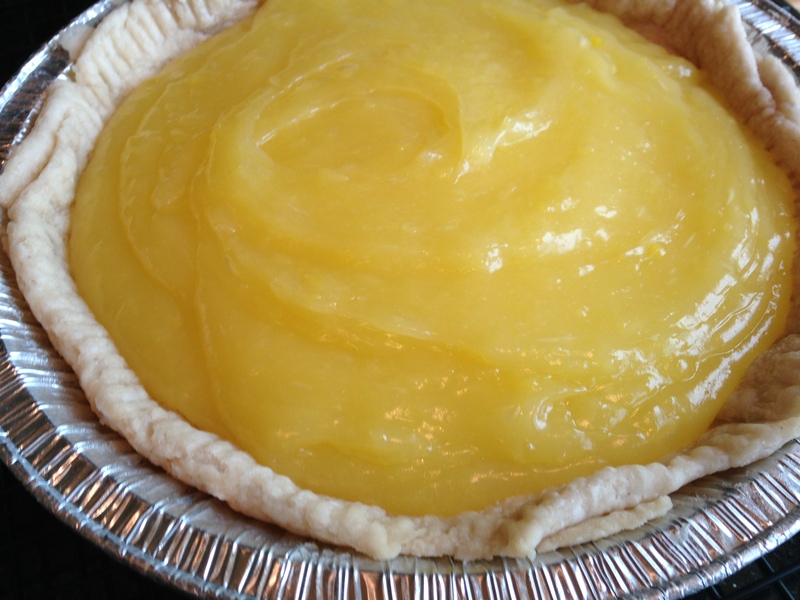 Pour the filling into the cooled crust and spread until kind of flattish. 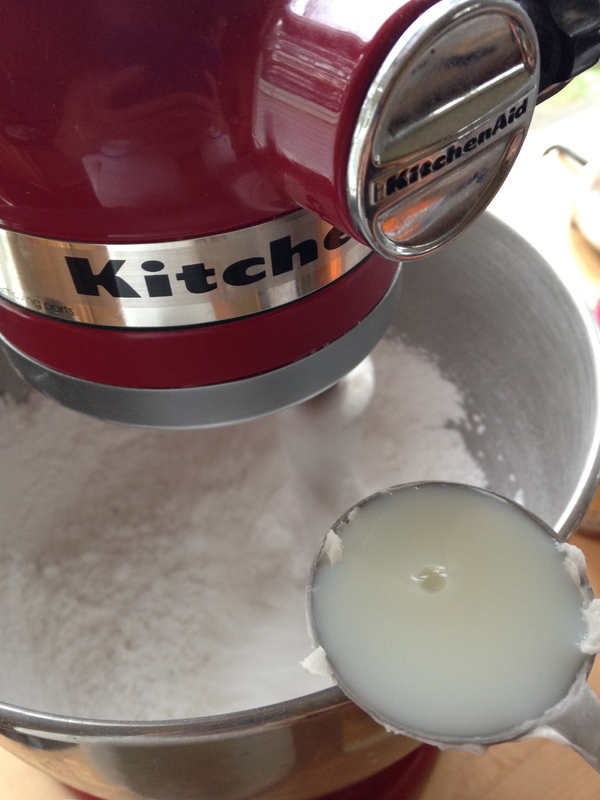 Now for the meringue – it really is simple with a stand mixer. 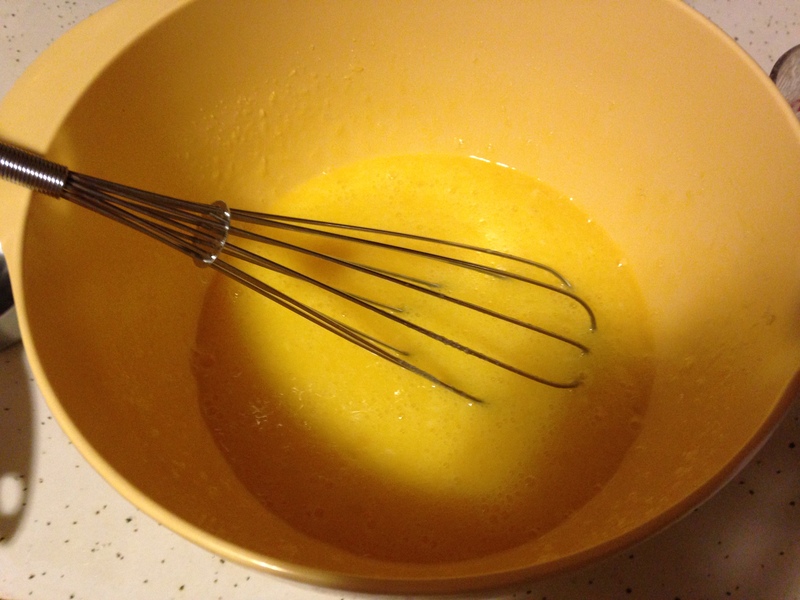 Put the whisk attachment on and beat the egg whites and cream of tartar at medium-high speed until foamy. 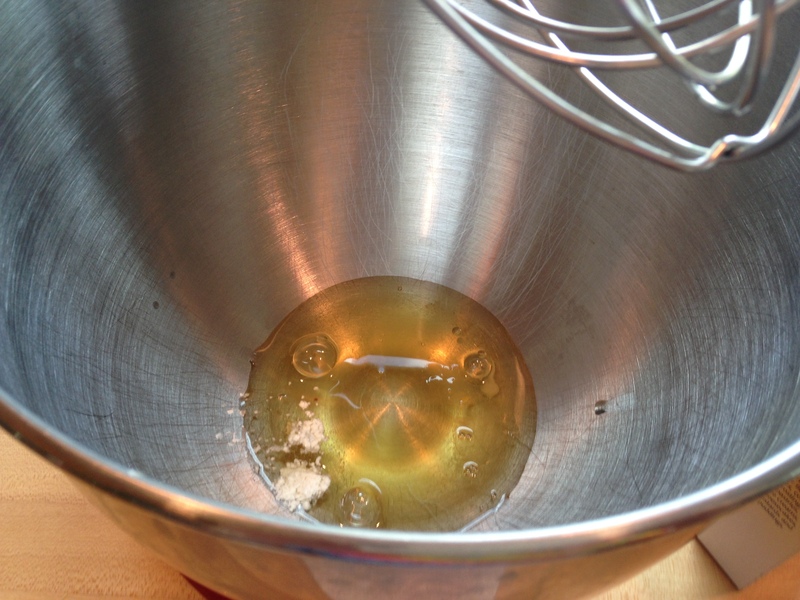 Add the sugar, one tablespoon at a time, and beat until shiny and stiff. 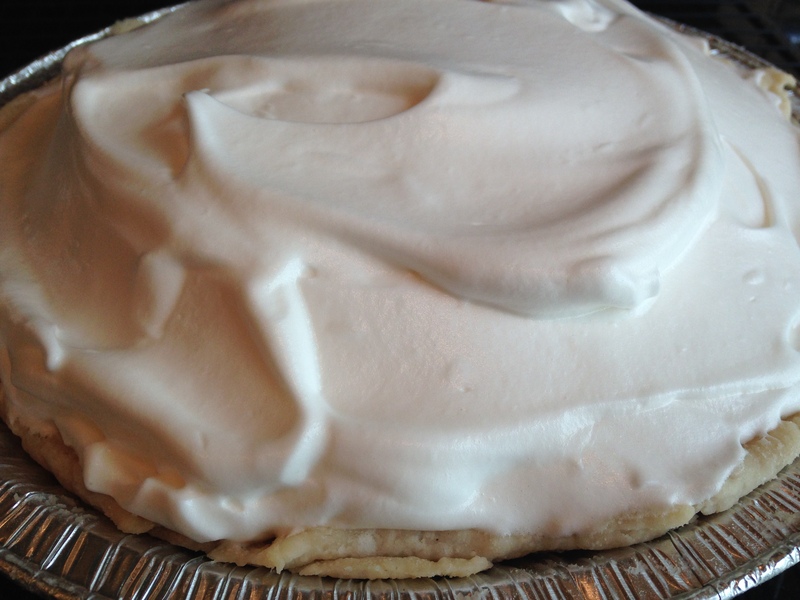 Spoon the meringue onto the warm filling and spread all the way to the crust on each side. I kept reading reviews of the topping shrinking in, so I think this is the best way to ensure that doesn’t happen. 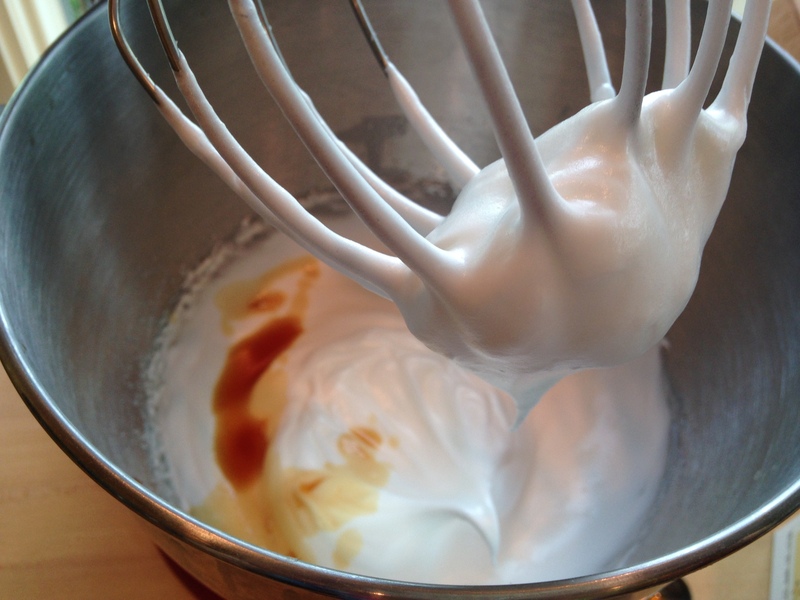 Bake at 400°F for 8-12 minutes until the meringue is lightly browned. Remove to wire rack to cool at room temperature for 2 hours. From here, you can store it in the refrigerator until ready to serve – it is best when chilled. Not sure how long it will keep, probably a couple of days if you don’t mind the meringue seeping into the lemon filling part, less if you want them to stay separate. We didn’t have to find out since between six of us, we had no problem eating the pie in one sitting. 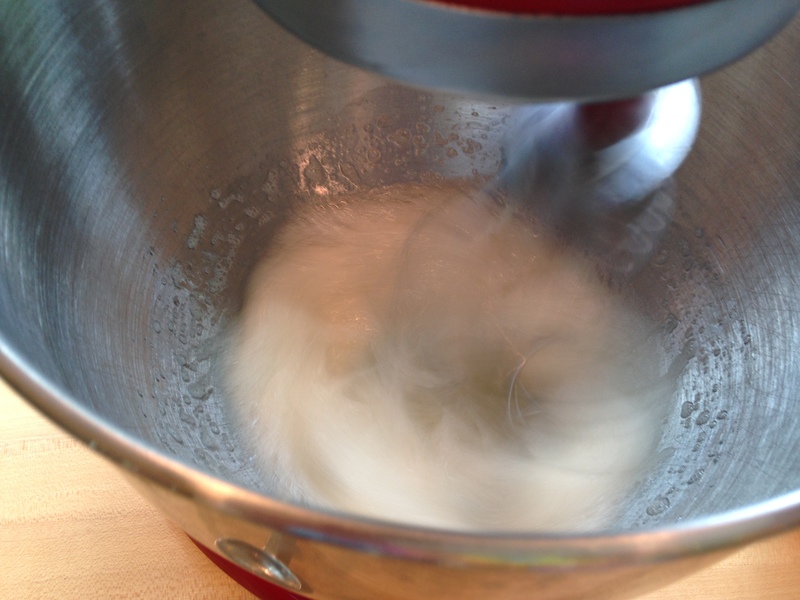 Whisk together flour and salt in a medium bowl with a fork. Cut in shortening until grains are the size of peas. 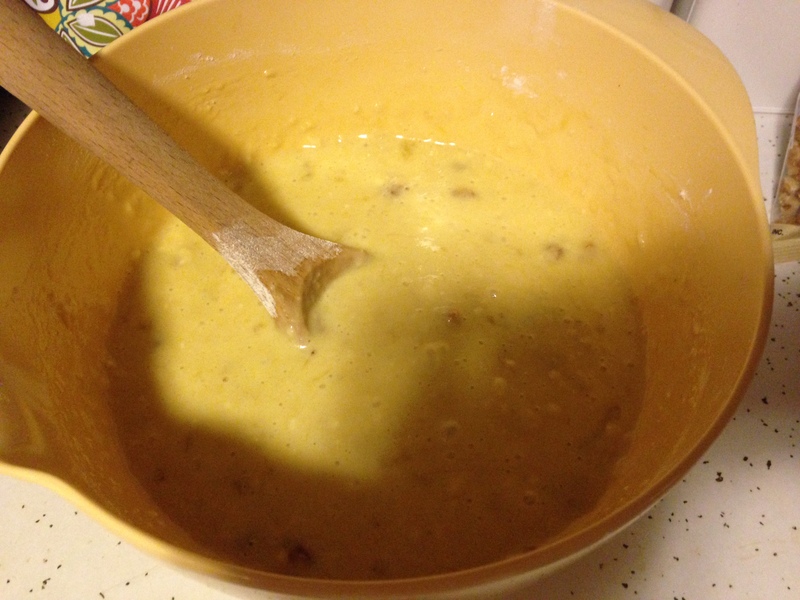 Add water, one tablespoon at a time, mixing with fork after each addition until dough comes away from sides of bowl. 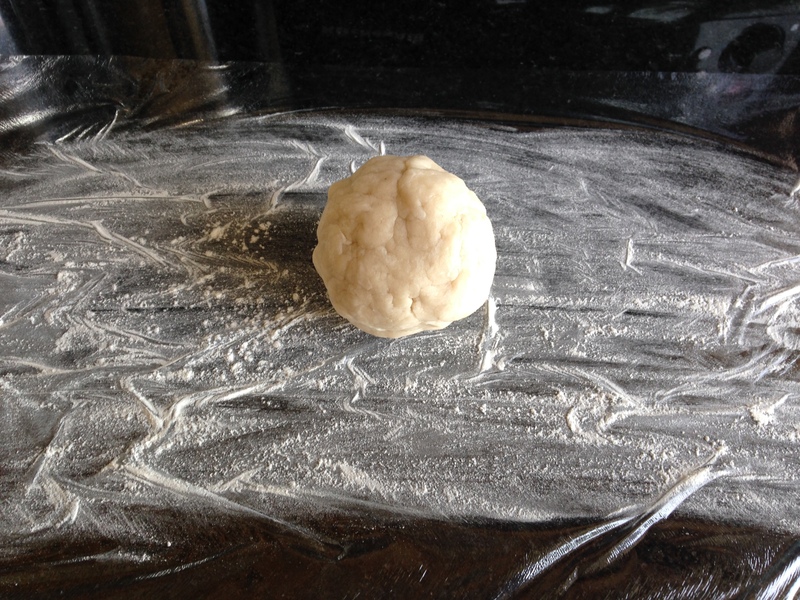 Gather dough into a ball and place on floured plastic wrap. Press into round disc and wrap. Store in refrigerator for about 45 minutes. 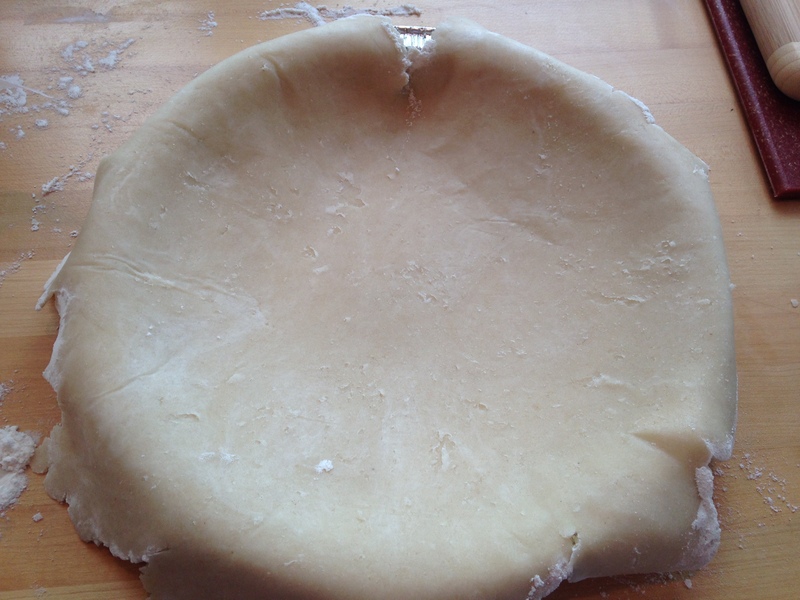 Roll out dough on wax paper until about 2 inches wider than a 9 inch pie plate flipped upside down. 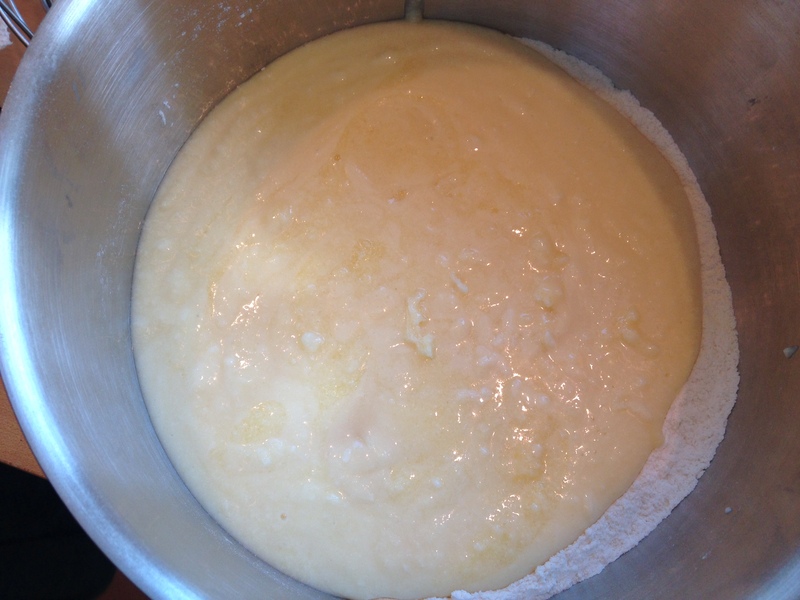 Flip dough into plate and press into sides and bottom. Roll under edges until even with plate and flute as desired. Prick thoroughly with fork and bake at 475°F for 8-10 minutes until light brown. Remove from oven and cool on wire rack. Reduce oven heat to 400°F. 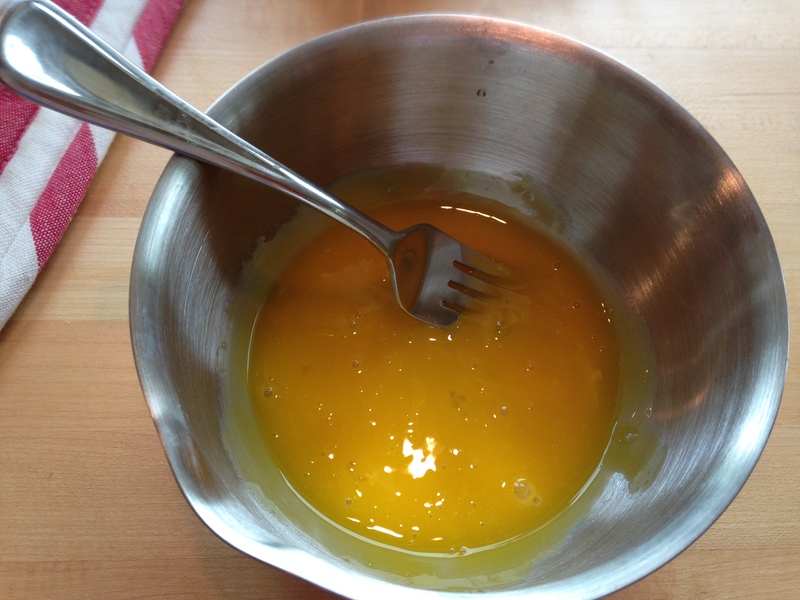 Whisk egg yolks in a small bowl with a fork. 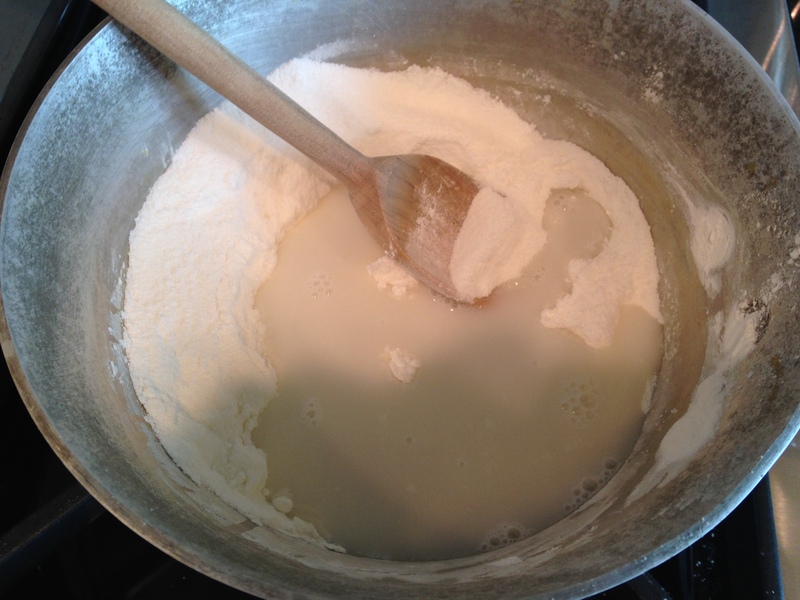 In a medium saucepan, mix together sugar and cornstarch. 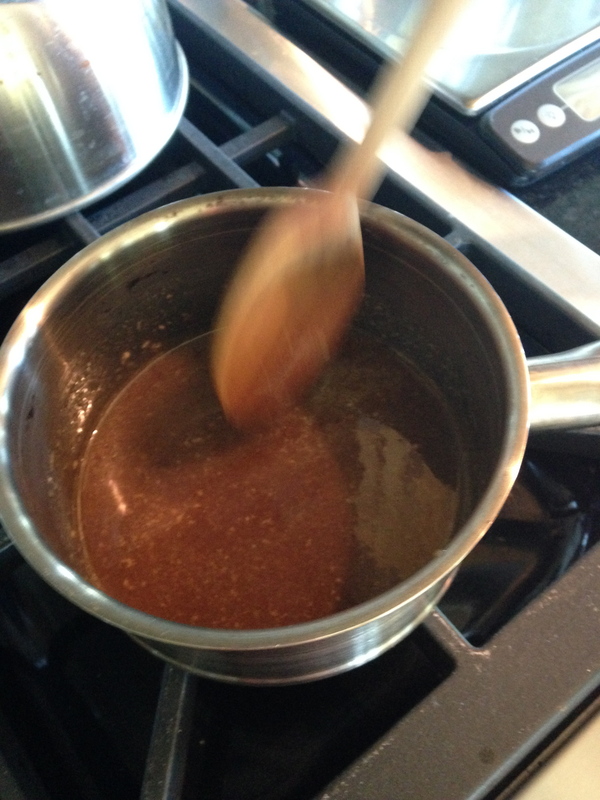 Add water, about half a cup at a time, to sugar mixture, stirring to combine. Cook over medium heat, stirring constantly, until it begins to thicken. Boil for 1 minute, continuing to stir. 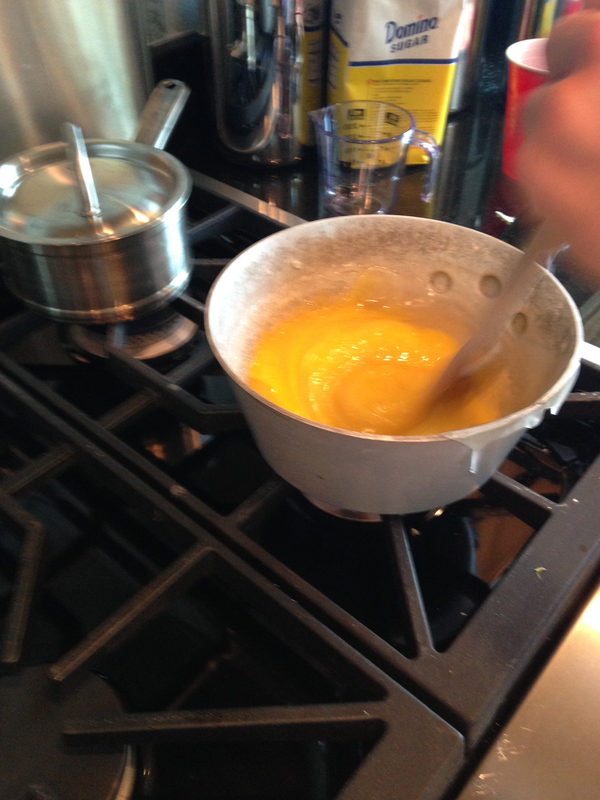 Pour about half of the sugar mixture into the egg yolks and stir. 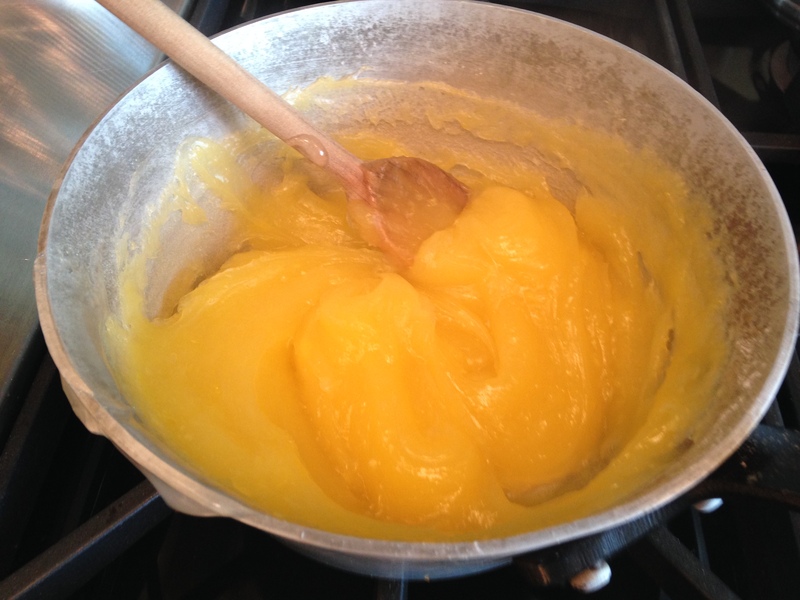 Pour egg yolk mixture back into saucepan and continue to cook and stir over medium heat for two minutes. 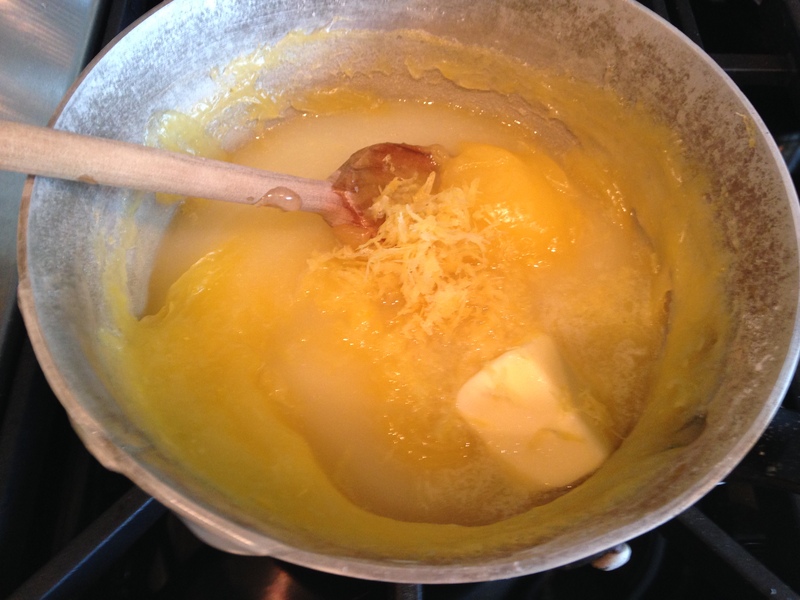 Remove from heat and stir in butter, lemon zest and lemon juice. 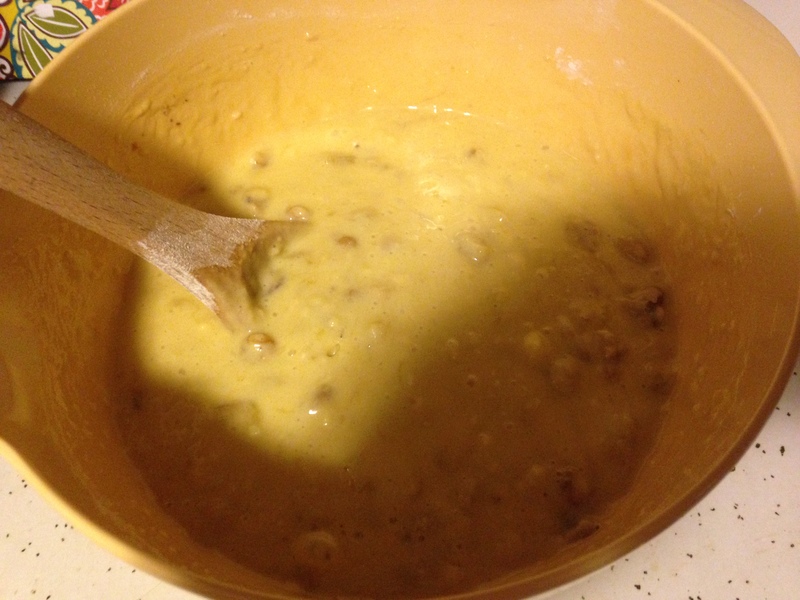 Pour filling into crust and spread evenly. 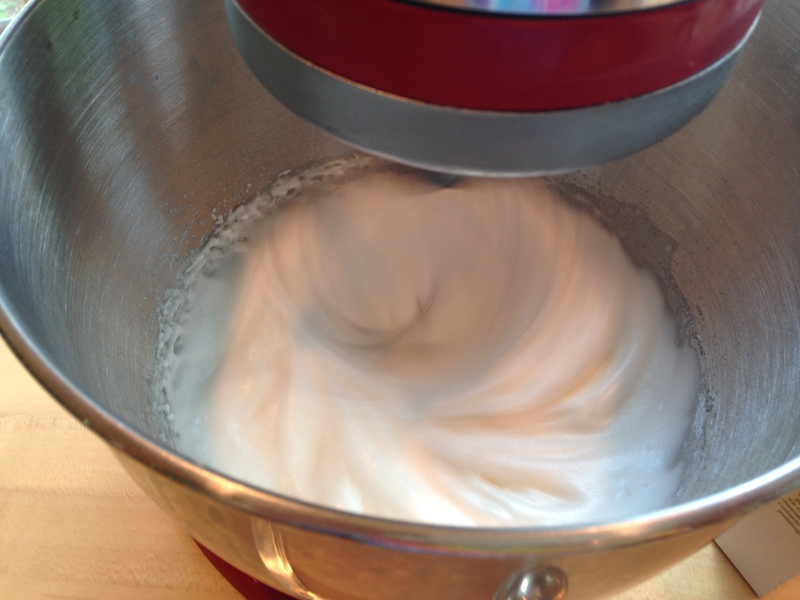 Beat egg whites and cream of tartar using the whisk attachment of a stand mixer at medium-high speed until foamy. 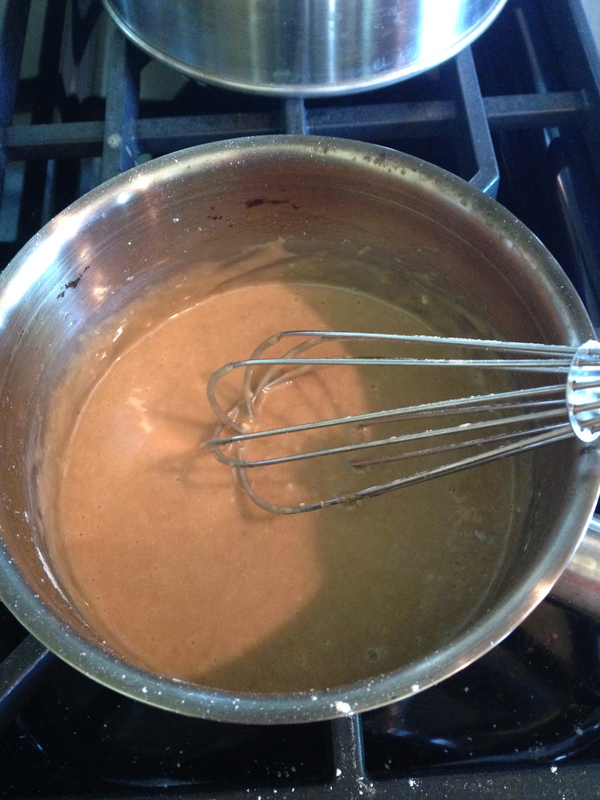 Add sugar, one tablespoon at a time, continuing to beat until glossy and stiff. Spoon meringue onto top of warm filling mixture, spreading all the way to the crust on each side. 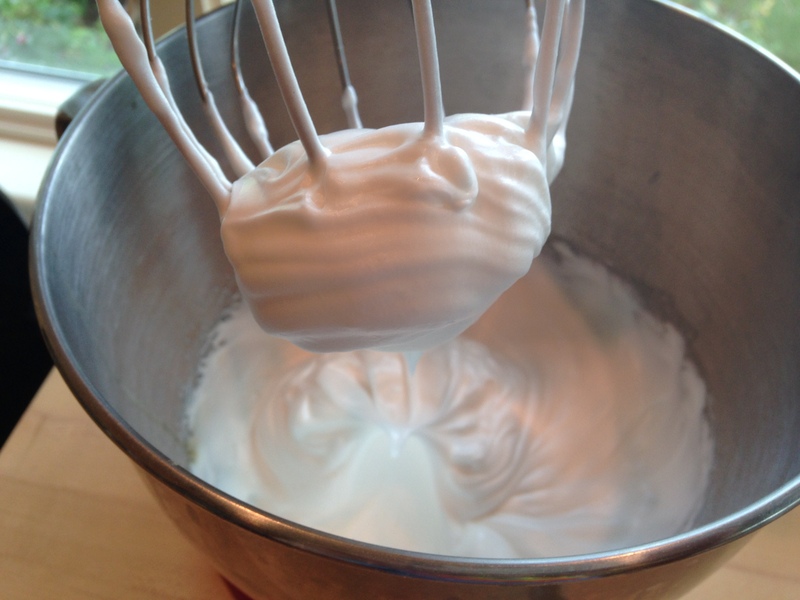 Bake at 400°F for 8-12 minutes until meringue is lightly browned. Remove to wire rack to cool for 2 hours before transferring to refrigerator to chill before serving. This weekend, I had the pleasure of hosting the lovely Molly Hayes for plenty of beach time and country music. And since we went to college together, we decided to recreate a treat from a favorite bakery in New Haven: Claire’s. Thanks to Marj, I have the Claire’s cookbook, and the cookbook has my absolute favorite cake from the store: Lithuanian Coffee Cake. However, as is often the case when spending time with Molly, this particular baking expedition turned into quite the adventure. Despite a few mishaps, though, we were able to salvage our attempt into a pretty excellent new recipe with a few alterations. Don’t worry, New Haven friends – I will try again with the Lithuanian Coffee Cake later, but for now, take solace in our experimental version: Brown Sugar Glazed Coffee Cake. 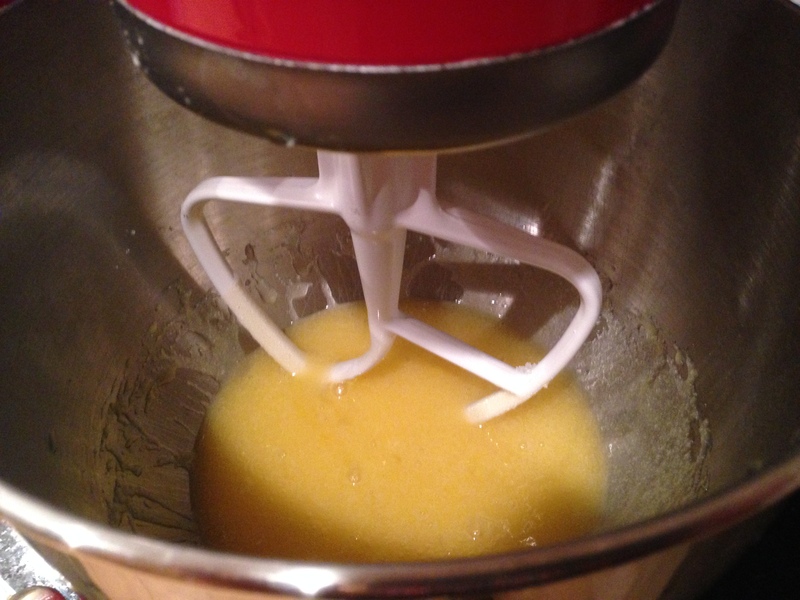 First, cream together the butter and sugar in a stand mixer using the paddle attachment. Add the sour cream, coffee, and vanilla, and again beat until smooth, making sure to scrape down the sides. 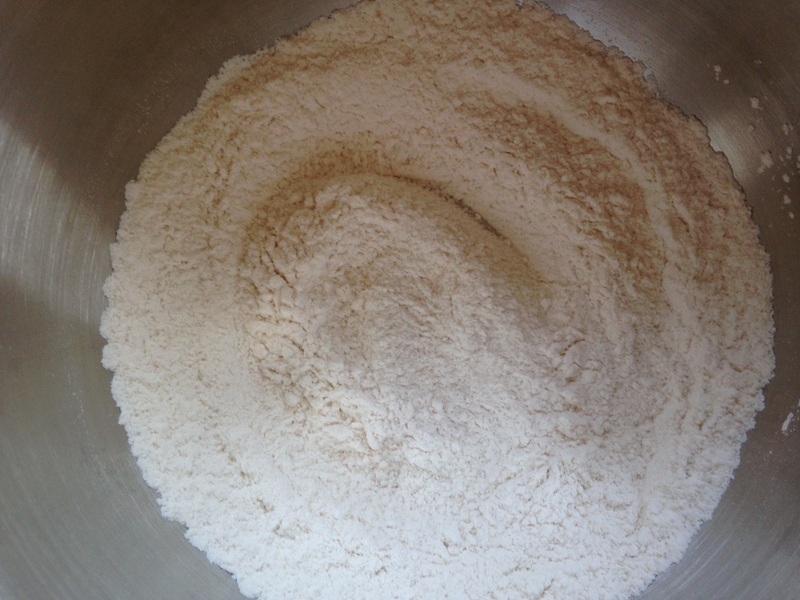 In a separate bowl, whisk together the flour, baking powder, and baking soda. Pour the liquid ingredients over the dry ingredients (I was surprised, too) and mix until just combined with a wooden spoon. Now, here is where the adventure started. We had spent the morning hunting for a bundt pan in my parents’ new house, but everything was in boxes and we didn’t have any luck. We decided instead that a regular cake pan would work fine. However, in Lithuanian coffee cake, you spoon half the batter in, then half the filling, then the other half of the batter and sprinkle with the remaining filling. When we put half the batter into the cake pan, it didn’t cover the bottom. Deciding to roll with it, we just put all the batter in and topped the batter with the filling, with the hopes of turning it into a kind of upside-down Lithuanian Coffee Cake. That way we would still get the brown sugar, cinnamon, walnut and raisin layer. For those of you just making the Brown Sugar Glazed version, put all the batter into a 9 inch round cake pan, sprayed with cooking spray. Since it wasn’t a bundt pan, we figured it would cook a little faster. Put it in the oven at 350°F for about half an hour to 40 minutes, or until a toothpick comes out clean. Don’t worry, it will rise quite a bit. Allow to cool for 5 minutes in the pan before flipping onto a wire rack to cool completely. We may have struggled a bit on that last step there, too. You see, about 30-40 minutes into the baking time, the filling, that we were hoping would melt, really was still just sugar. And a crumbly sugar bottom wasn’t what we were going for. So I had Molly switch on the broiler to quickly melt the top. The cake itself, though, was actually still fine. So I flipped it over and we went out to kayak and brainstorm how to save it. The other recipe in the running for the weekend had been banana bread scones, which had a nice brown sugar glaze on them. We thought, why not put it on our coffee cake? So next up: a brown sugar glaze. 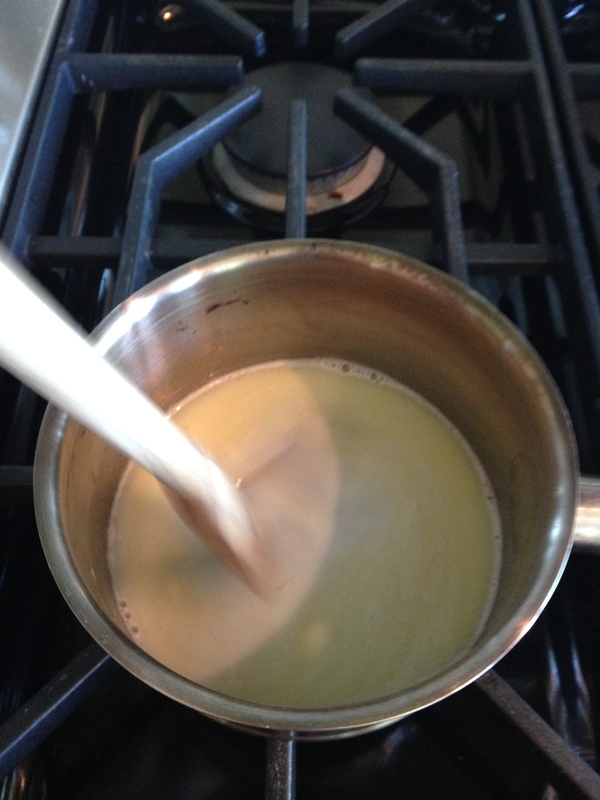 First, melt the butter and milk over low heat, stirring constantly. 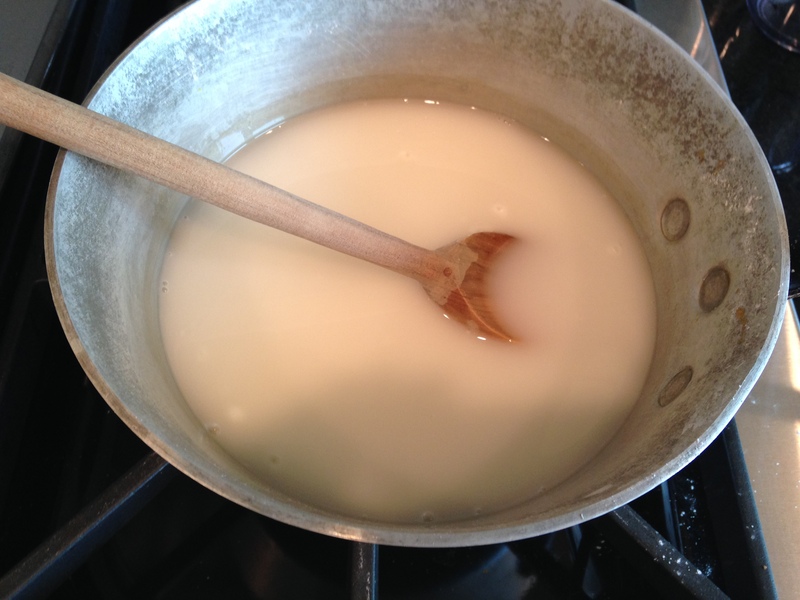 Add the brown sugar and coconut (or vanilla) extract, stirring until melted. 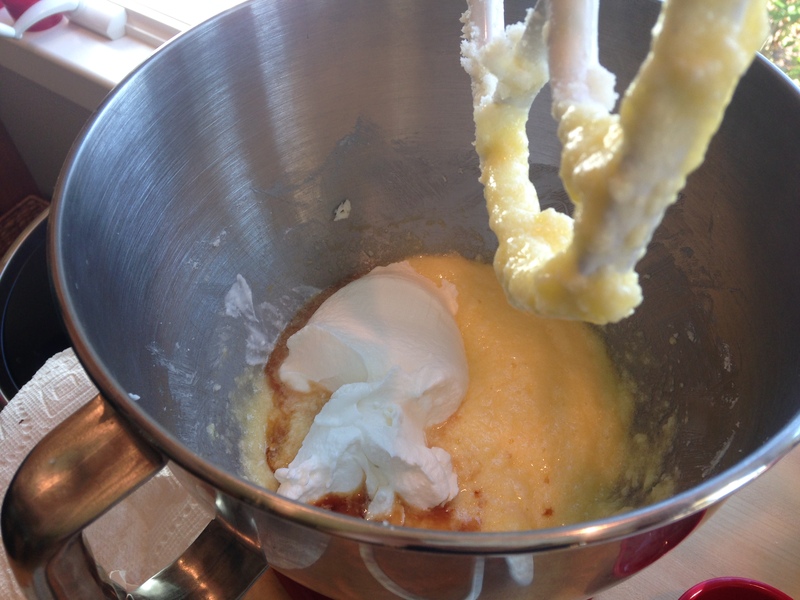 Remove from heat and whisk in enough confectioner’s sugar to reach your desired consistency – I wanted it to spread but not run over the sides. 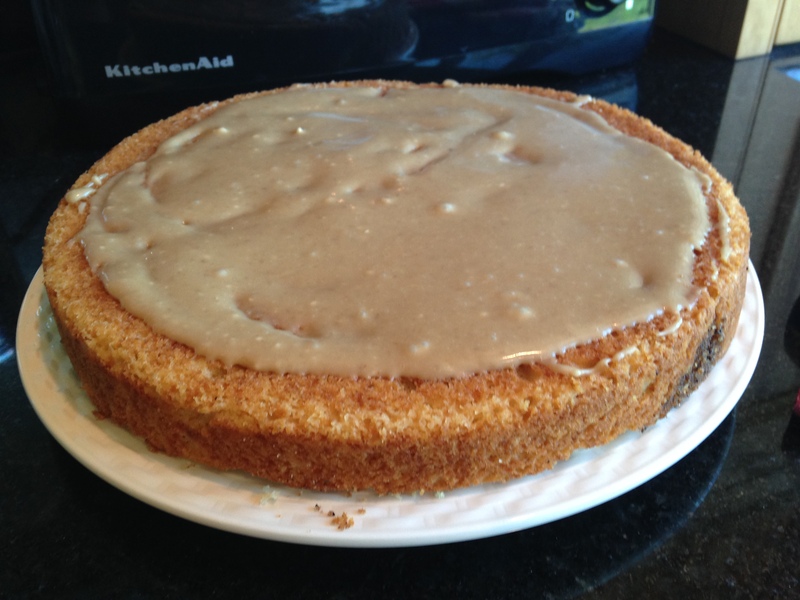 Spread onto cooled coffee cake, allow to cool so it hardens, and serve! 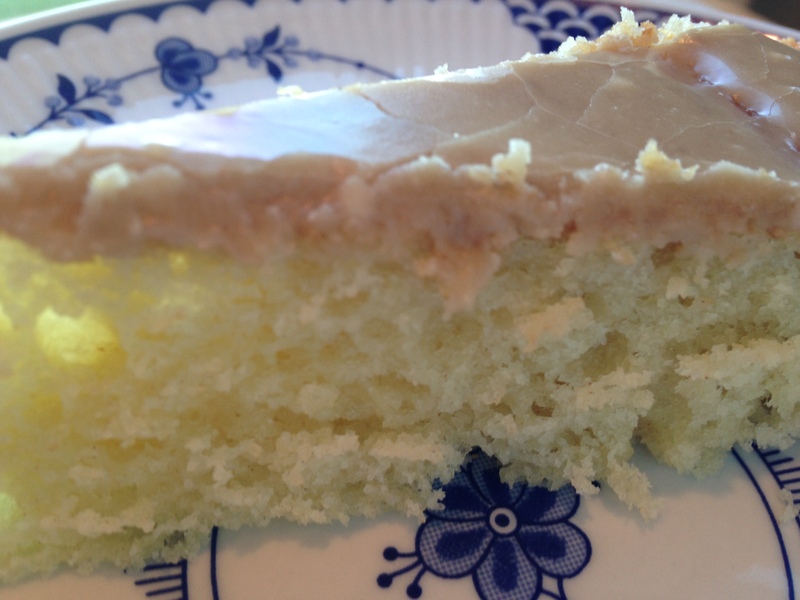 I’ve always thought Claire’s cake is actually better the next day, when it’s a little stale, but feel free to serve it same day if you prefer your coffee cake on the cakier side. 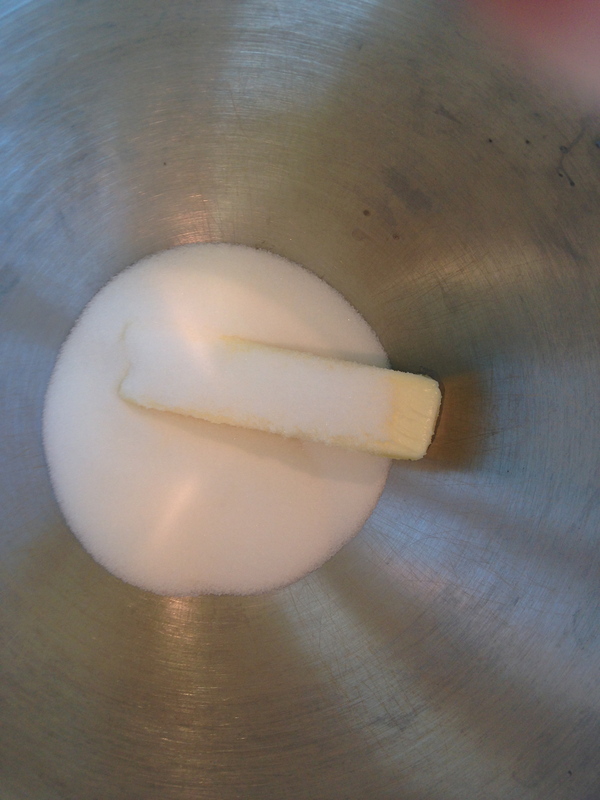 Cream butter and sugar in the bowl of a stand mixer using the paddle attachment on medium speed. 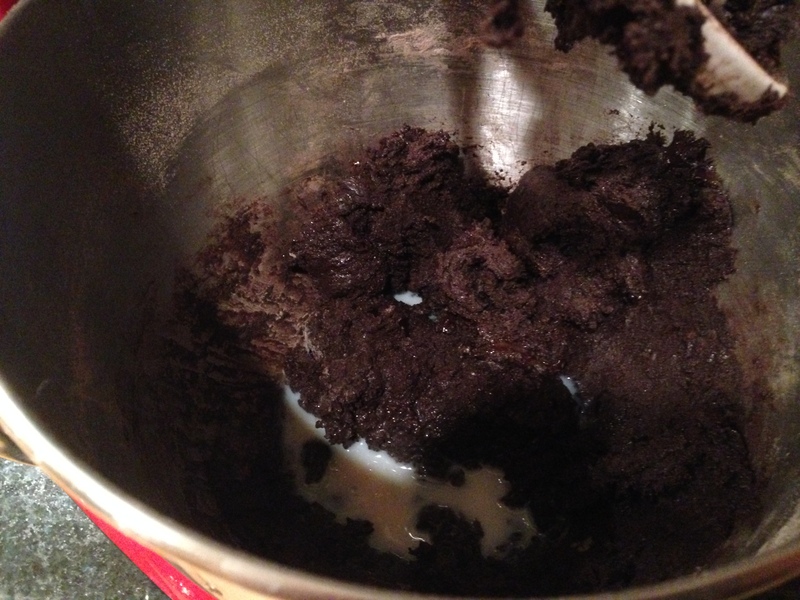 Add coffee, vanilla extract, and sour cream and beat until combined, scraping down sides. 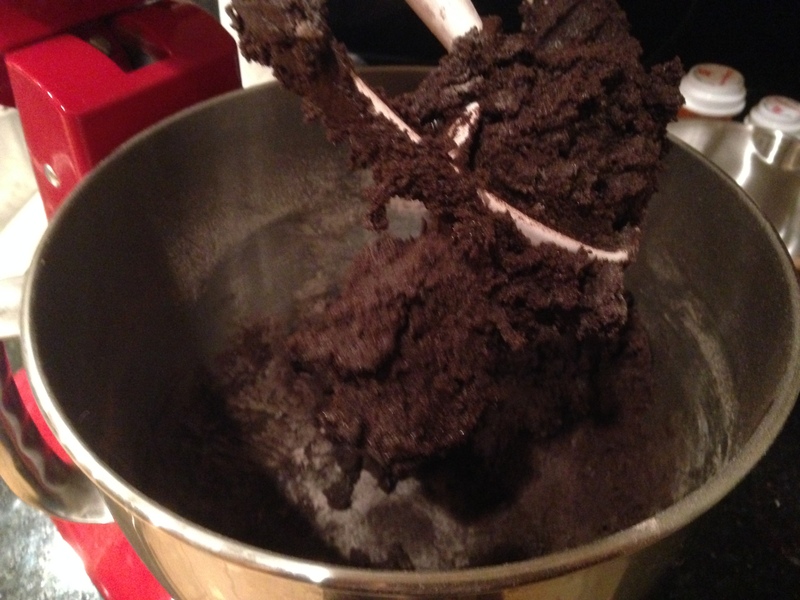 Pour wet ingredients over dry ingredients and stir with wooden spoon until just combined. Pour batter into sprayed 9 inch round cake pan. Bake at 350°F for 30-40 minutes, until a toothpick inserted in the middle comes out clean. Cool in pan 5 minutes before transferring to wire rack to cool completely. 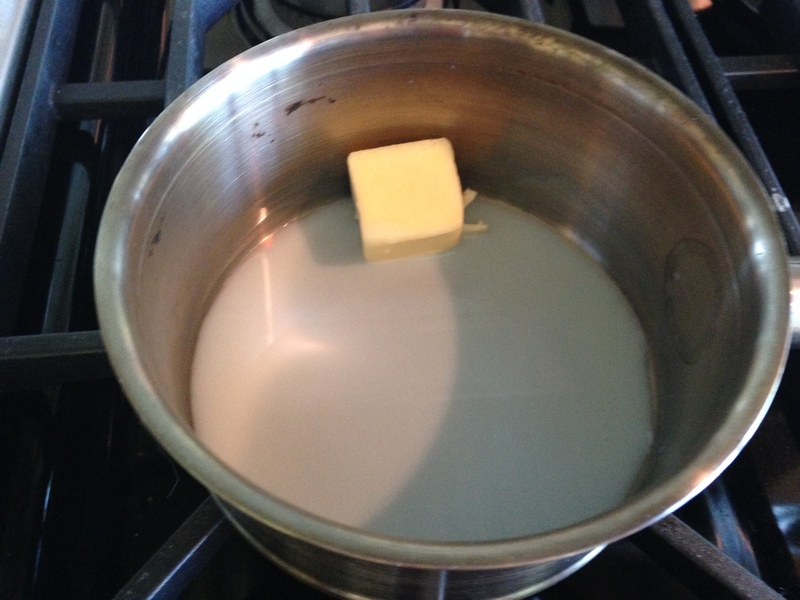 Melt butter and milk over low heat, stirring constantly. 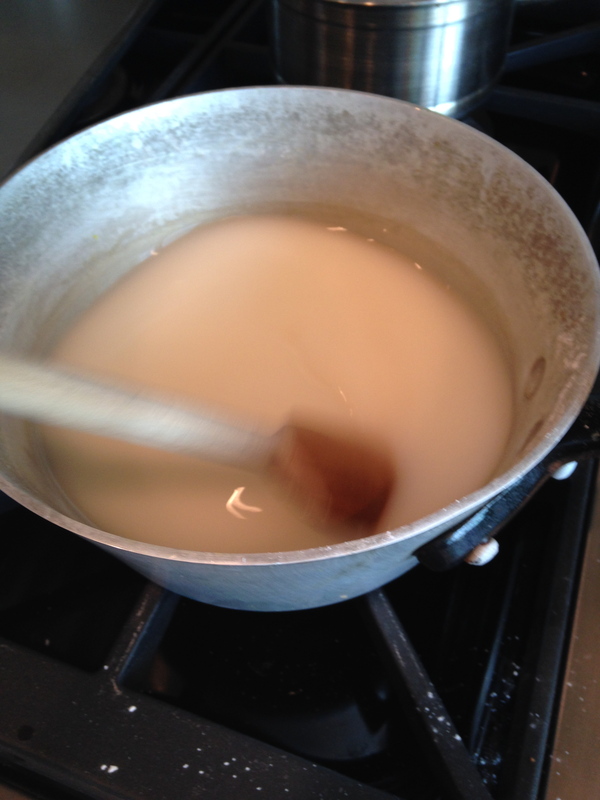 Add brown sugar and coconut extract, stirring until melted. 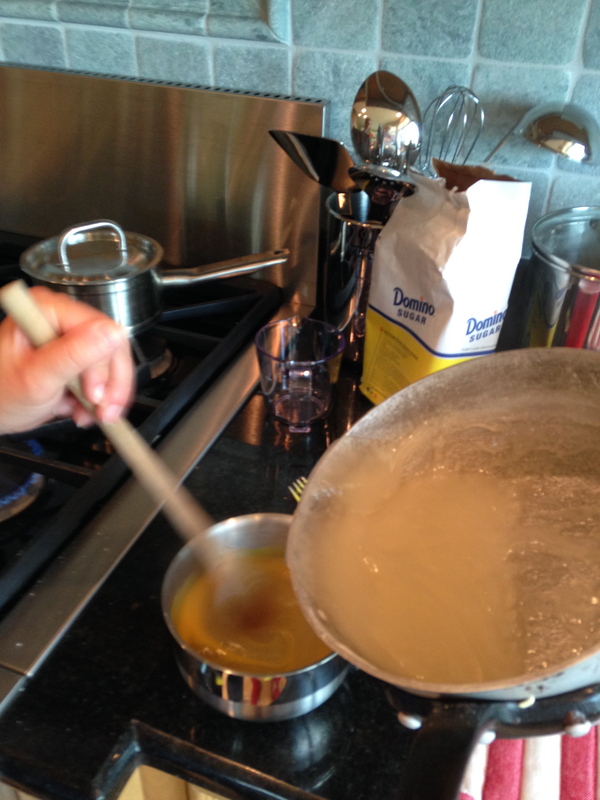 Remove from heat and whisk in enough confectioners’ sugar to reach the desired consistency. 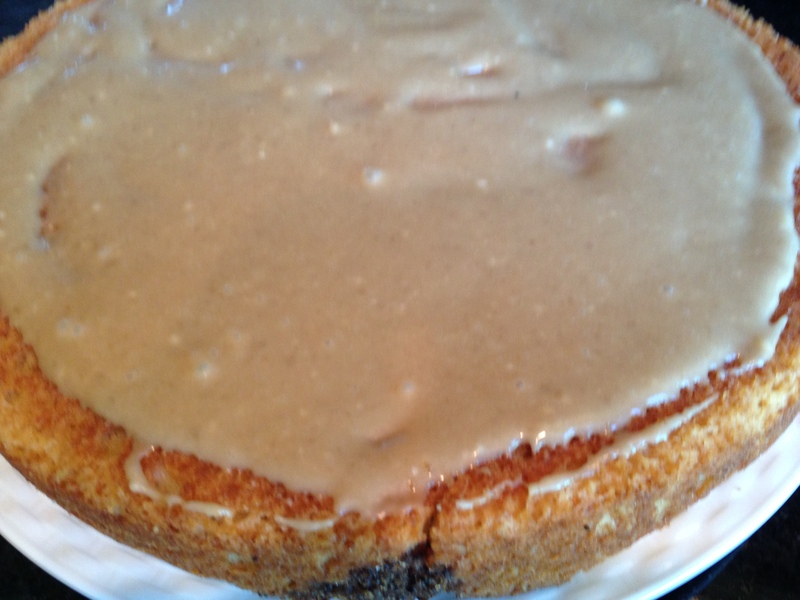 Spread on cooled coffee cake, allow to harden, and serve. Full disclosure: I made these on the 3rd of July, not the 3rd of August. But as I mentioned earlier, when you don’t have a staff room to drop the treats off in on Monday morning, you have to save some recipes for later if you want to save yourself from death by diabetic coma. Anyways, I made them for the third of July because I wanted to make something that seemed like a good, wholesome American dessert without being explicitly red, white and blue. I also wanted to make something on the smaller side that could be enjoyed in addition to lots of other yummy cookout food. 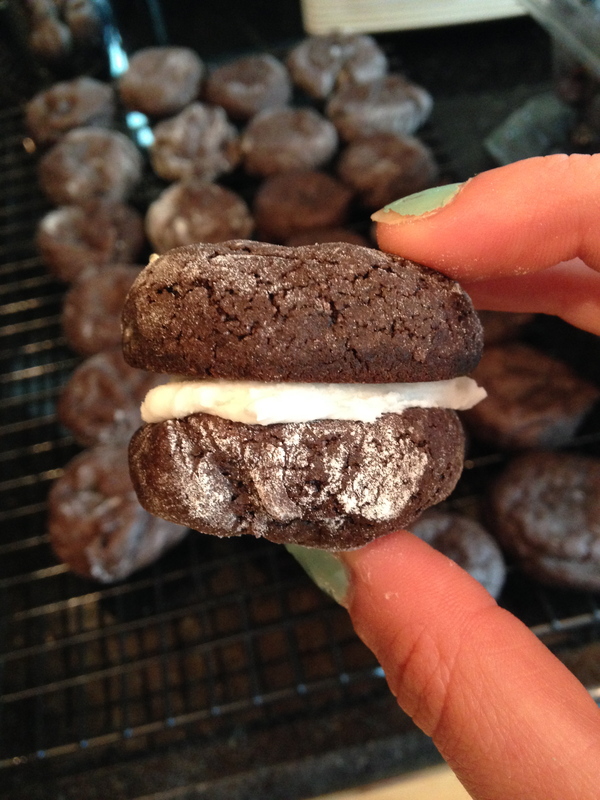 That led me to set out to find a good whoopie pie recipe. 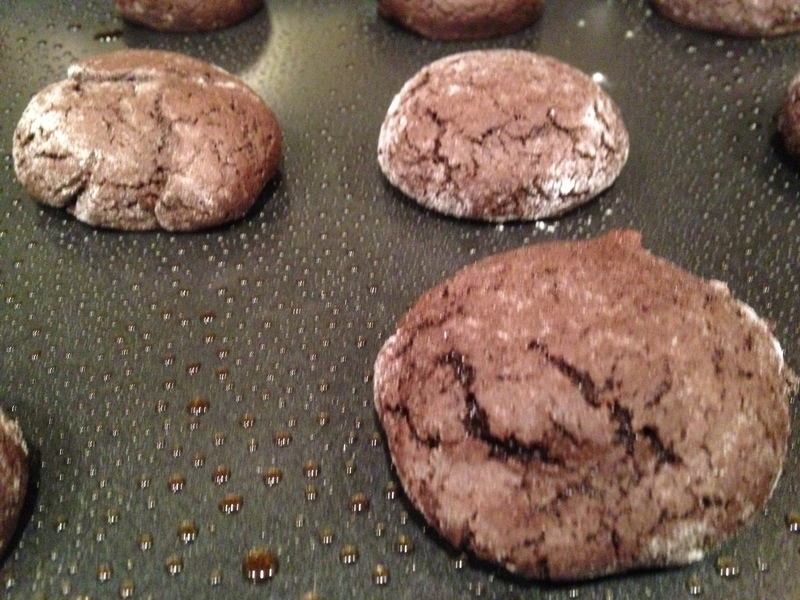 Shockingly, just regular chocolate cookie/vanilla filling whoopie pie recipes were hard to come by. I was under the impression that that was the standard combination, but apparently the variations have taken over. However, I knew I needed the original. One Thanksgiving, I made the grave error of going with pumpkin whoopie pies with cream cheese filling. 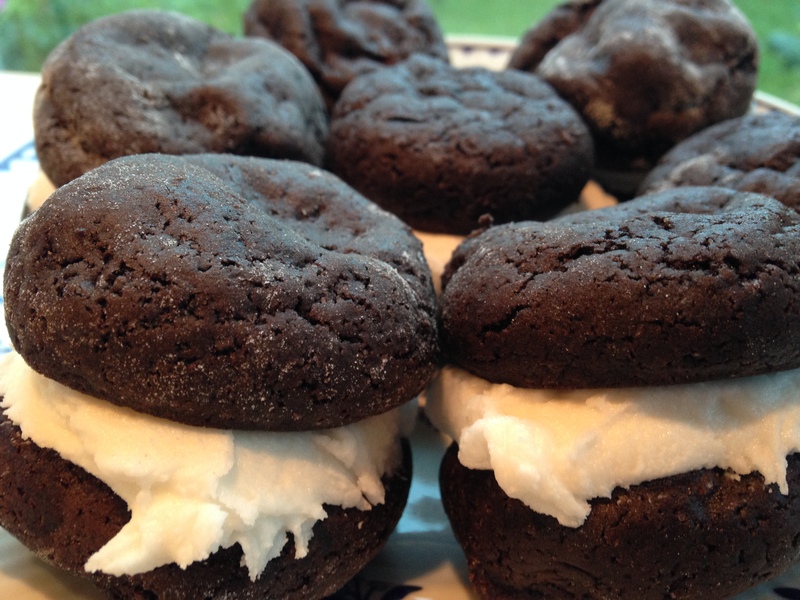 My dad declared them an abomination of the whoopie pie, which was actually the same way I felt about my mom’s gingerbread version of the chocolate trifle – apparently there are some recipes that really should not be seasonally modified. Anyways, unwilling to again endure the wrath of my father by going with the seemingly more popular mint chocolate version, here is your standard, chocolate and vanilla whoopie pie. 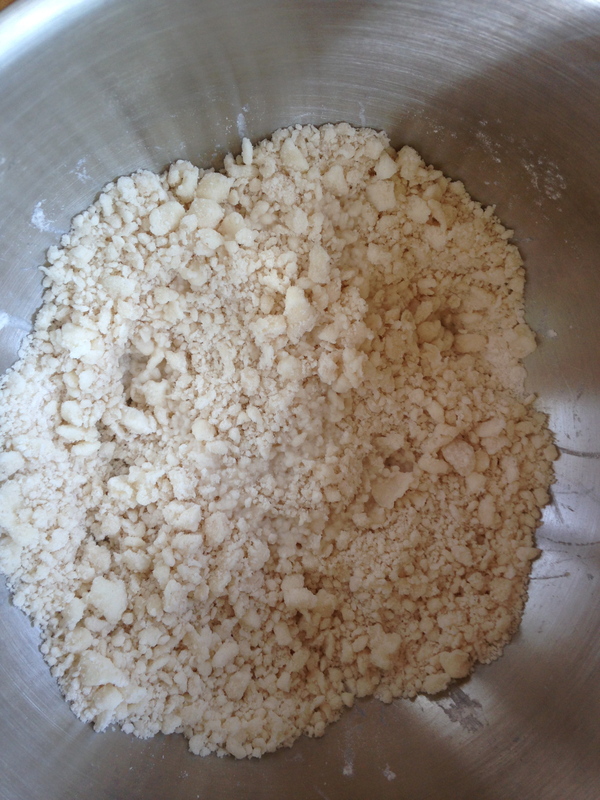 First, beat the sugar and oil together until crumbly. This is fine to use a hand mixer for, I just didn’t have one on hand. Next, add the eggs and beat well. 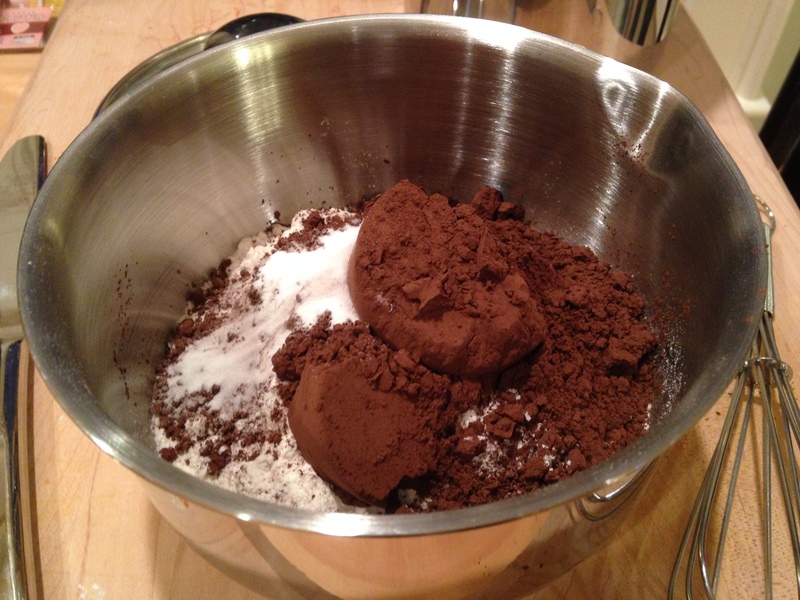 In a separate bowl, whisk together the flour, cocoa powder, and baking soda. 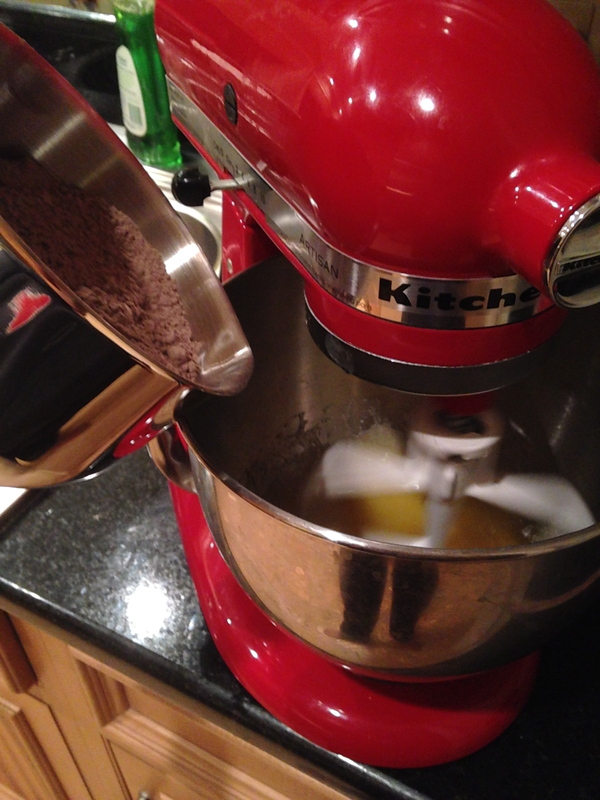 Gradually beat the cocoa mixture into the egg mixture. I usually add about a third at a time and beat until combined. Add the milk and beat well. 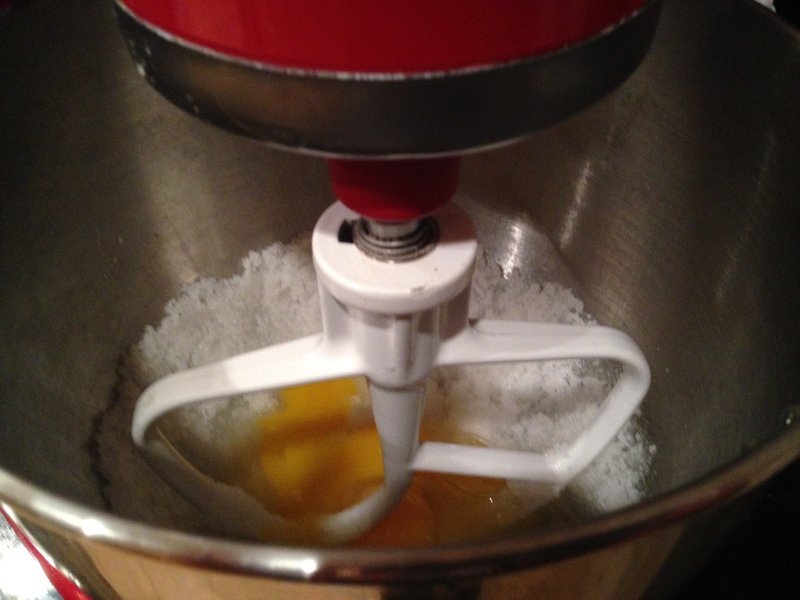 Though not as pretty as my yellow one, my mom’s red stand mixer does get the job done. This dough is really sticky, so it takes a bit of flour to really handle it. Spray a cookie sheet with cooking spray and lightly (or heavily) flour your hands. Roll dough into about 1 inch balls (or bigger, but I wanted two-bite treats) and place two inches apart on the cookie sheet. Spray the bottom of a glass with cooking spray and flatten the top of each ball slightly. Bake at 425°F for 5-6 minutes. Tops should crack before you remove them from the oven, after which you should let them cool on the cookie sheet for 3 minutes before transferring to a wire rack to cool completely. While those are cooling, you can make the filling. 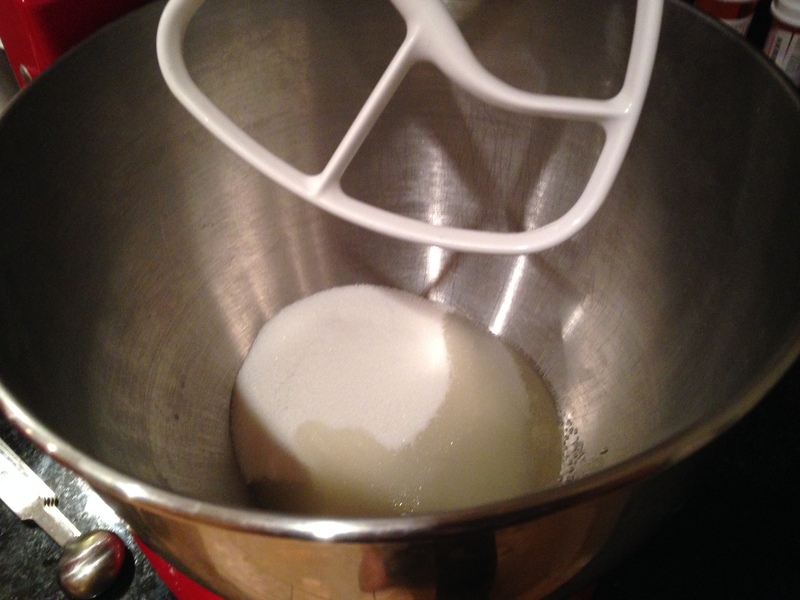 First, beat together the shortening and confectioner’s sugar. 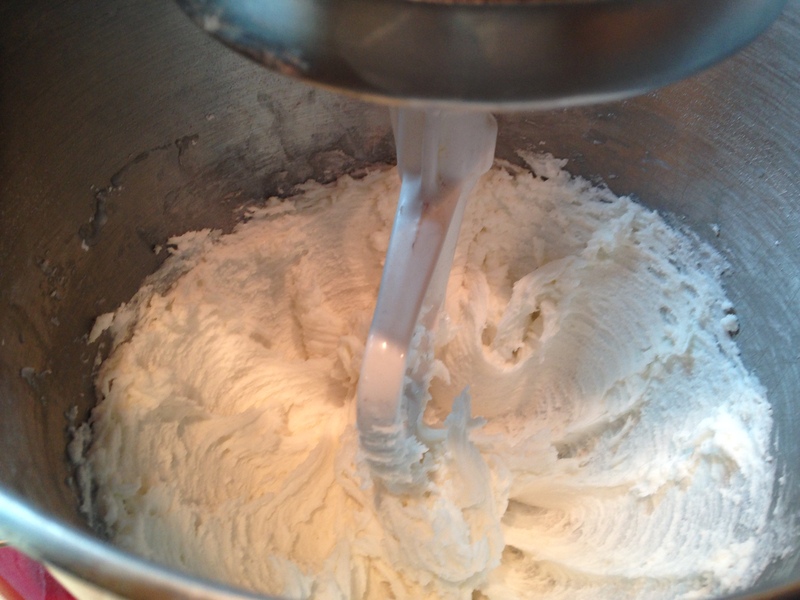 While beating, add the milk and vanilla extract and beat until fluffy. Scrape down the sides at some point to ensure all of that sugary goodness is going into it. Look how little they are! 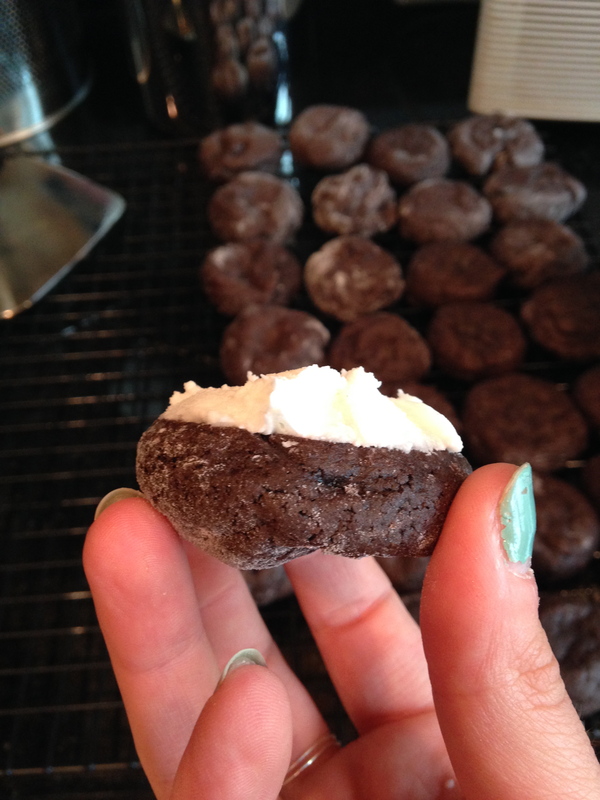 Anyways, serve same day if you want the filling to still be soft – otherwise you run the risk of hard frosting. Not a bad thing, but not quite as appealing to the masses. 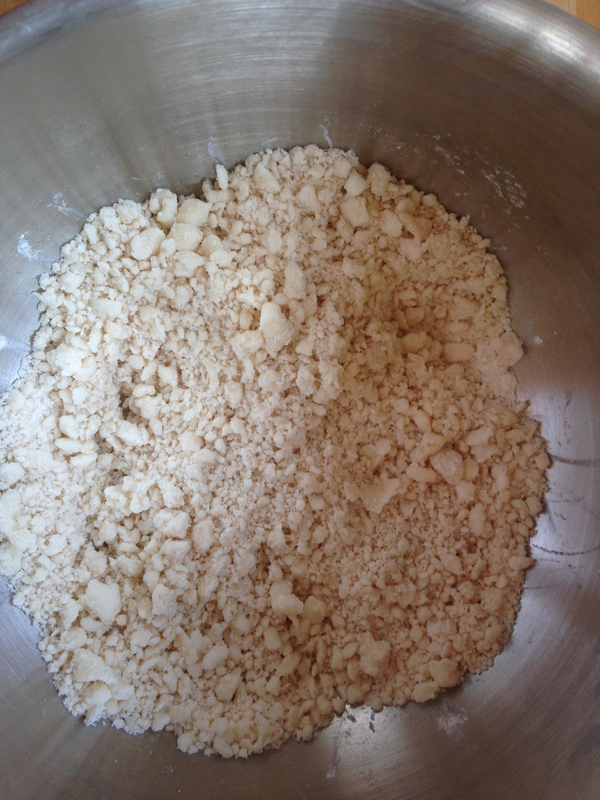 Beat together sugar and oil until crumbly. 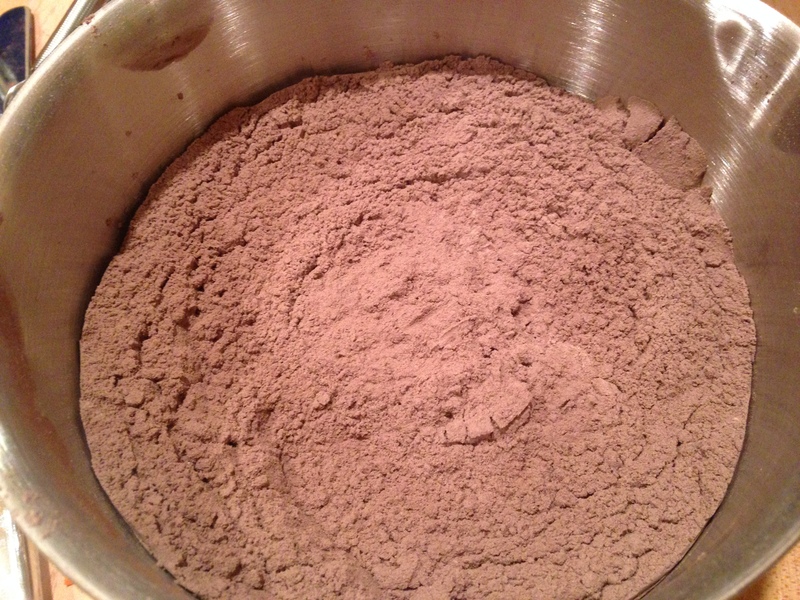 In a separate bowl, whisk together flour, cocoa powder, and baking soda. 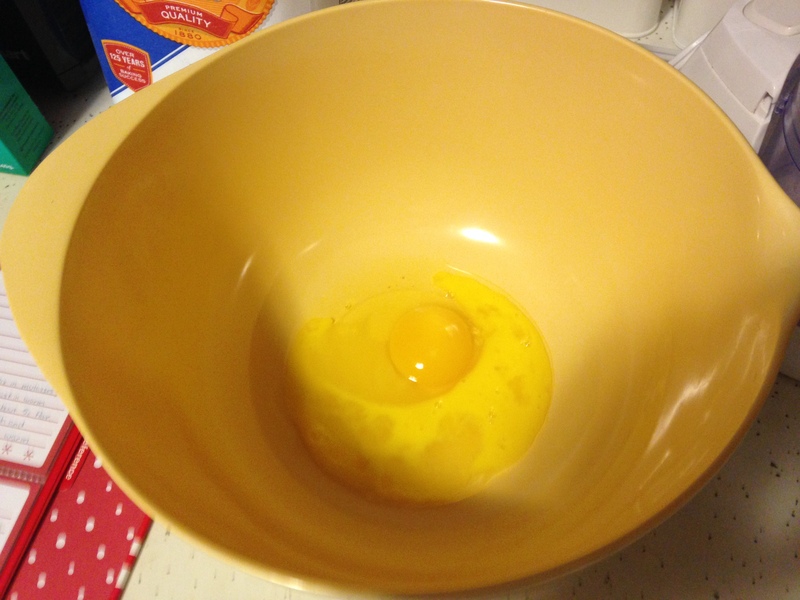 Add chocolate mixture to egg mixture gradually, beating well. Flour hands and roll dough into 1 inch balls. Place on cookie sheet sprayed with cooking spray, about 2 inches apart. Press each ball flat with the bottom of a glass sprayed with cooking spray. Bake at 425°F for 5 to 6 minutes until the tops crack. Cool on pan 3 minutes before transferring to wire rack to cool completely. 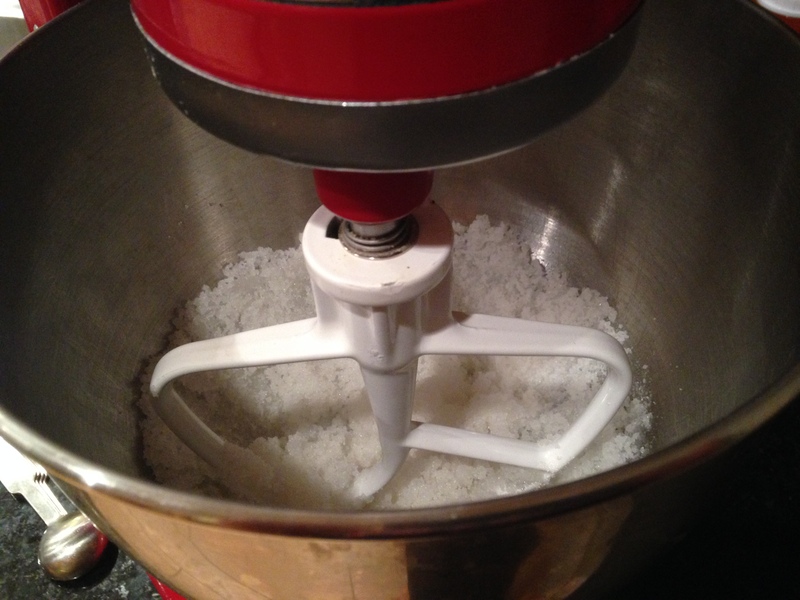 Beat together confectioners’ sugar and shortening. 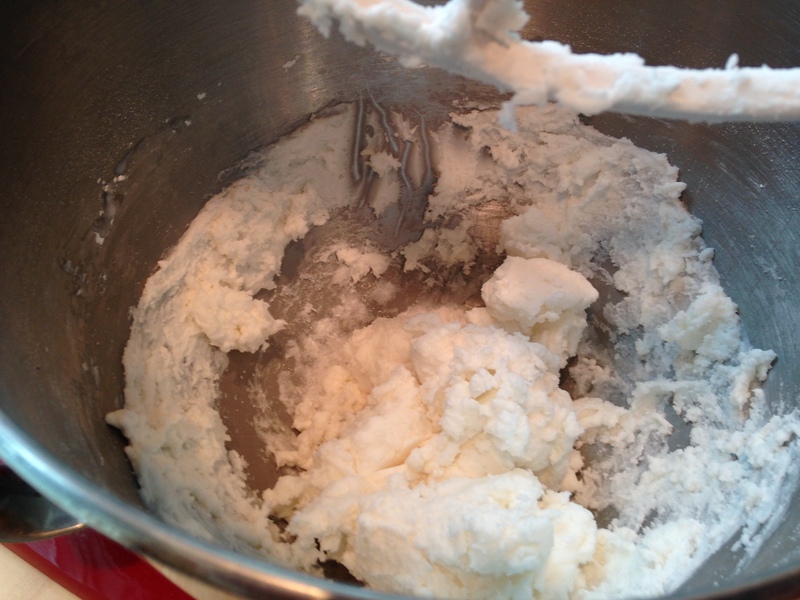 While beating add milk and vanilla extract and beat until fluffy. Spread some filling on the flat side of a cooled cookie and top with a second cookie.